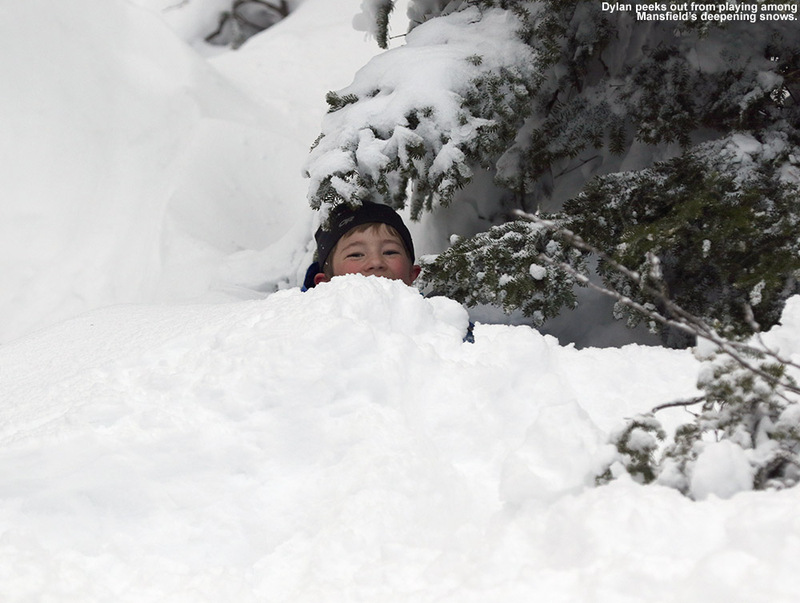 Over the past couple of days, a storm has dropped over 20 inches of dense snow on Mt. 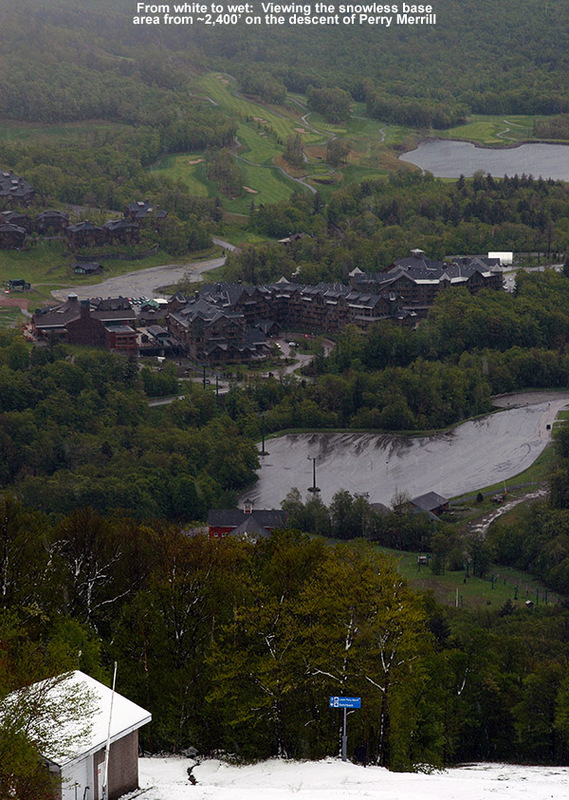 Mansfield and Stowe Mountain Resort. 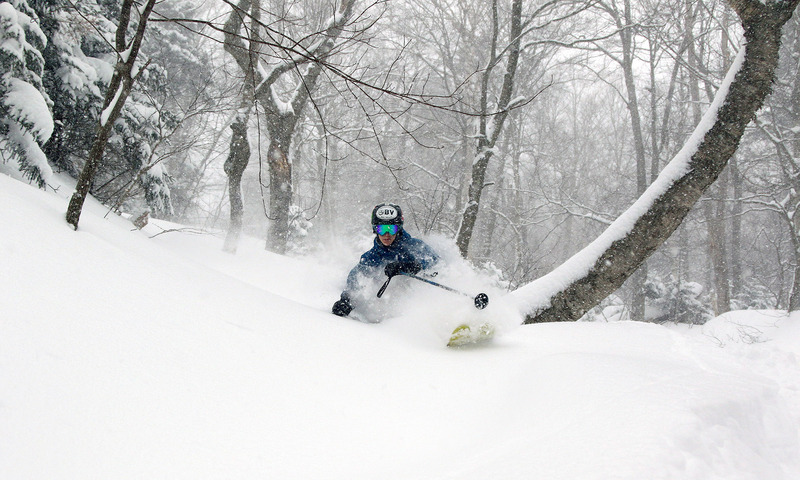 This storm is both building base and delivering plenty of powder. There really wasn’t much lead up discussion on the American Weather Forum about the winter storm we’ve been having in the Northern Greens the past couple of days. That’s because, while it looked like the mountains would muster up some snow accumulation, the models hadn’t really suggested that we’d be getting TWO FEET of accumulation. 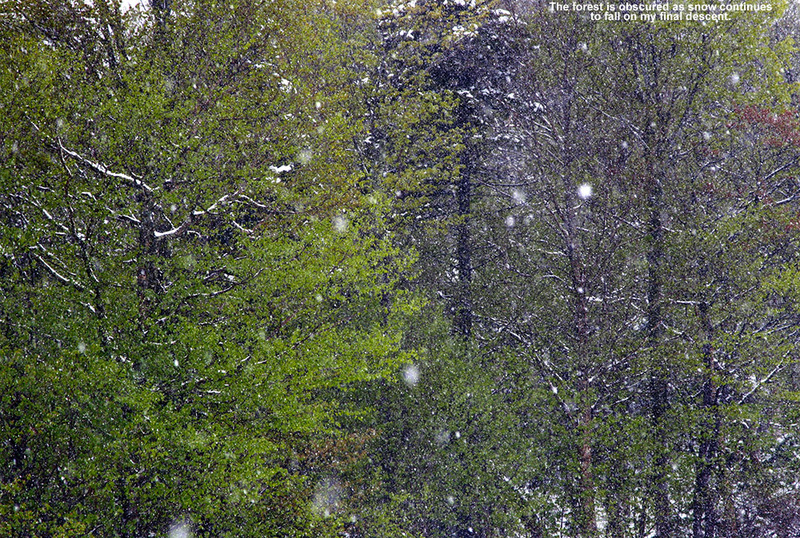 But, once the snow levels dropped into the mountains, Mother Nature just continued to drive that moisture into the spine of the Greens, and it kept snowing. It’s been snowing continuously now for two straight days. 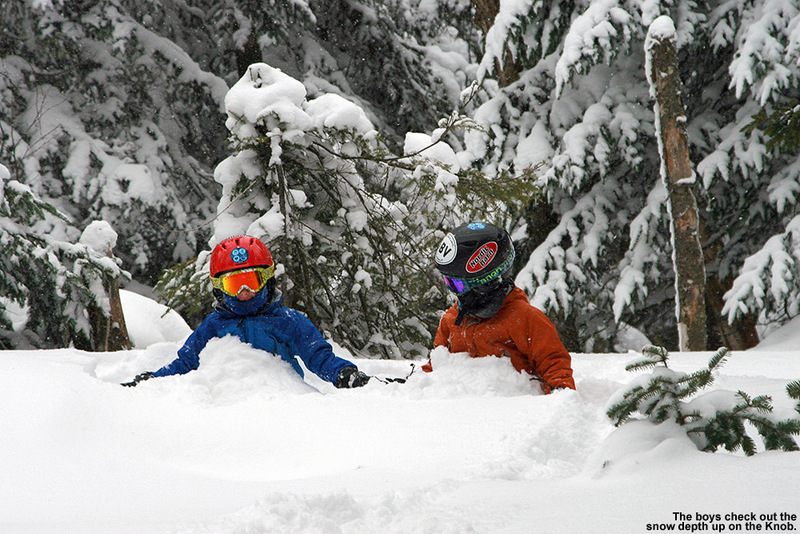 While our last winter storm (Argos) hit Bolton Valley hard with over two feet of snow, the initial reports from Powderfreak indicated that Mt. 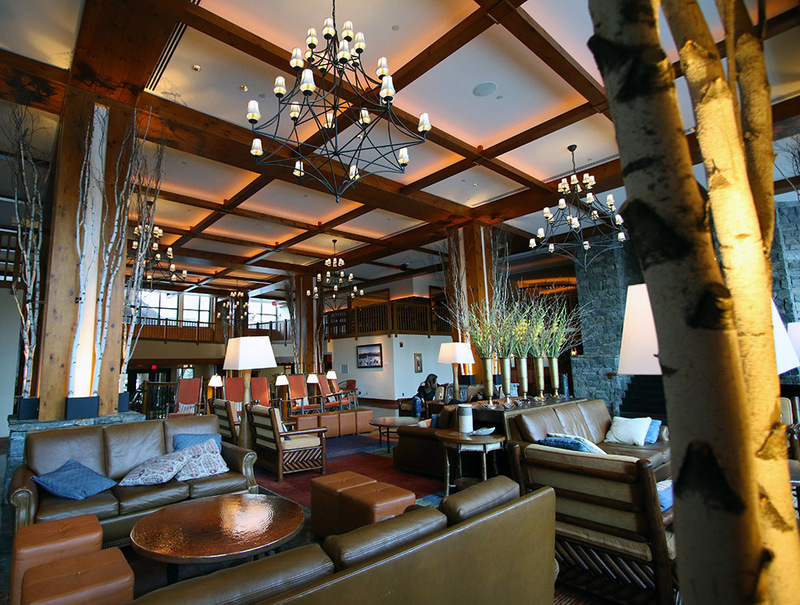 Mansfield and Stowe Mountain Resort were really doing well with this one. 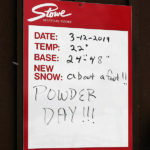 Stowe had picked up a half foot by Friday morning, and by early this morning Powderfreak was reporting a 16” storm total. 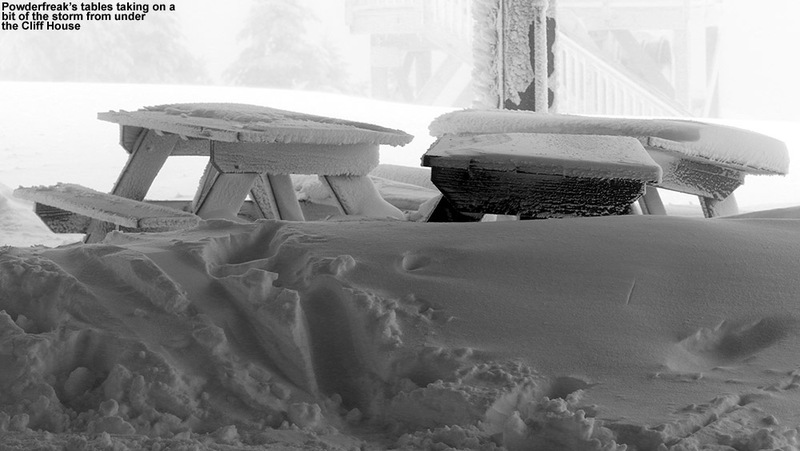 And, the snow just wasn’t letting up. 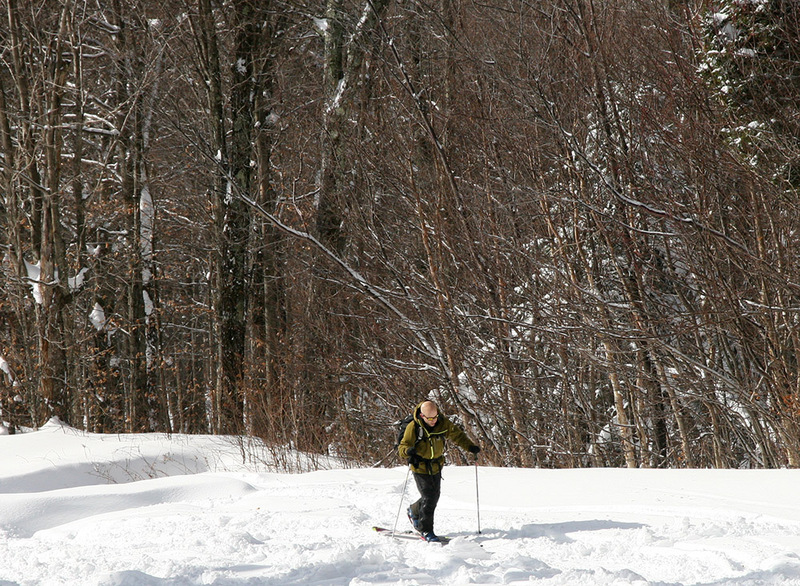 I had a number of great Bolton Valley ski days last week, and with the way the storm was going it looked like a perfect opportunity to mix things up a bit and head for the slopes of mighty Mt. Mansfield. 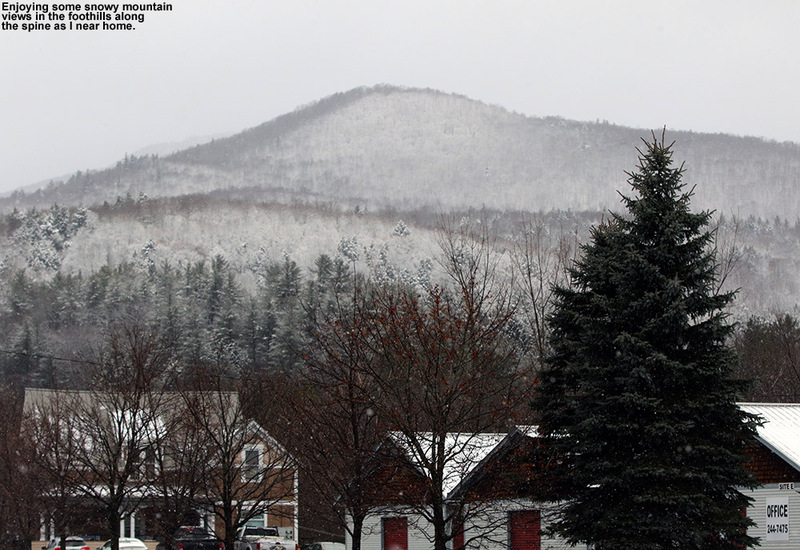 Snow filled the air down to the lowest mountain valleys today. 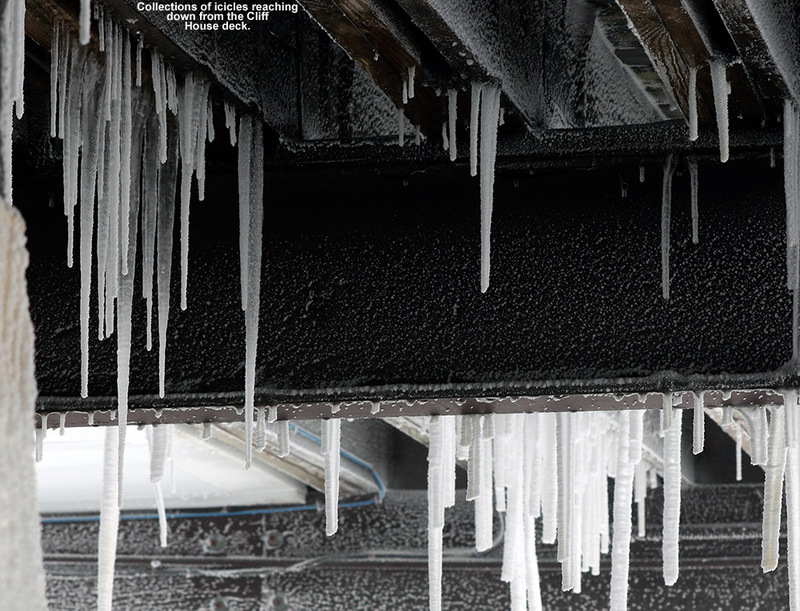 Temperatures were a degree or two above the freezing mark around in the lower mountain valleys at mid-morning when I was heading out today, and the precipitation was all snow, but accumulations were quite variable with the borderline freezing temperatures. 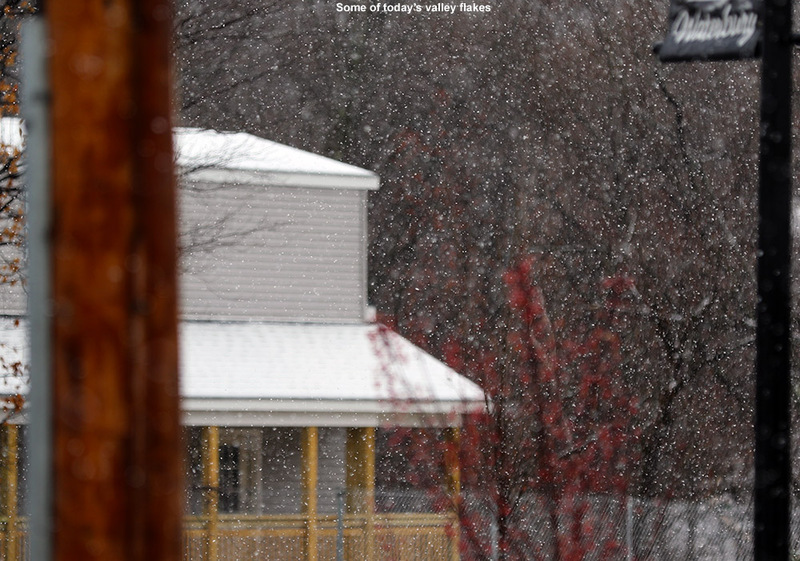 We had about an inch on the ground here at the house on the Waterbury/Bolton line, and that tapered off to much more patchy accumulations in Waterbury and Waterbury Center. The accumulations picked back up again once I was into the Stowe Village area, fairly similar to what we had at the house. 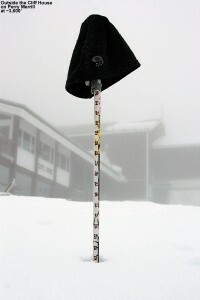 At The Matterhorn around the 1,000’ mark I’d say the snow depth was roughly 2 inches. 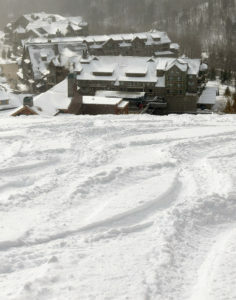 Just making that jump up to ~1,500’ at the base of the resort resulted in a huge increase in accumulations. My depth checks revealed ~10” of new snow at the base of the Gondola, and that measurement was fairly easy, since the old base had generally melted out down at that elevation. I skinned up Chin Clip Runout, since I like the grade, seclusion, and protection from any wind more than heading right up Gondolier. Actually though, winds today were pretty minimal in the lower mountain elevations, and with the temperature just a bit below freezing, it was really pleasant. Above mid mountain I started to get into the snow guns, and I meandered here and there from Switchback to Gondolier to Perry Merrill following various skin tracks to see if there were any quiet areas. But aside from Chin Clip, they had guns running all over the place. 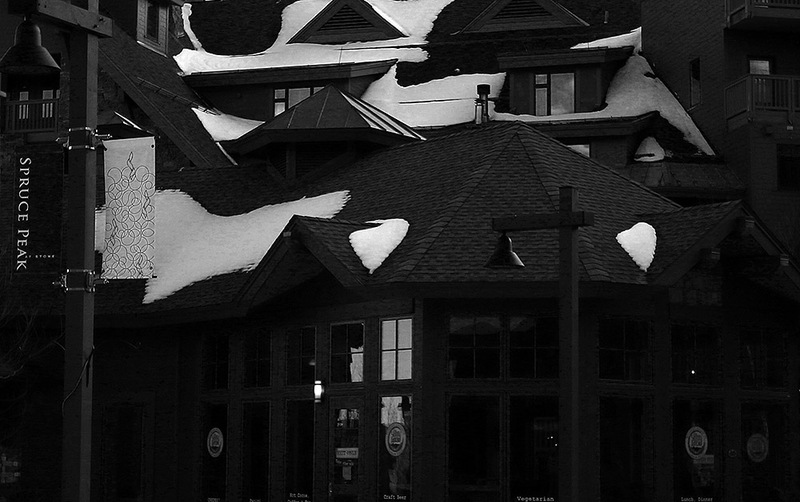 It’s noisy and ruins the natural snow in spots, but of course the resort has to blow snow when it’s time. I actually only headed above the 3,000’ mark for the exercise and to see what was up at that elevation, because I knew the skiing was going to be much better below that point. The winds were howling on that last section of Upper Gondolier, and pounding snow from the storm combined with snow guns every 50 feet or so blasting out their little ice particles made it a virtual whiteout. It was absolutely miserable. 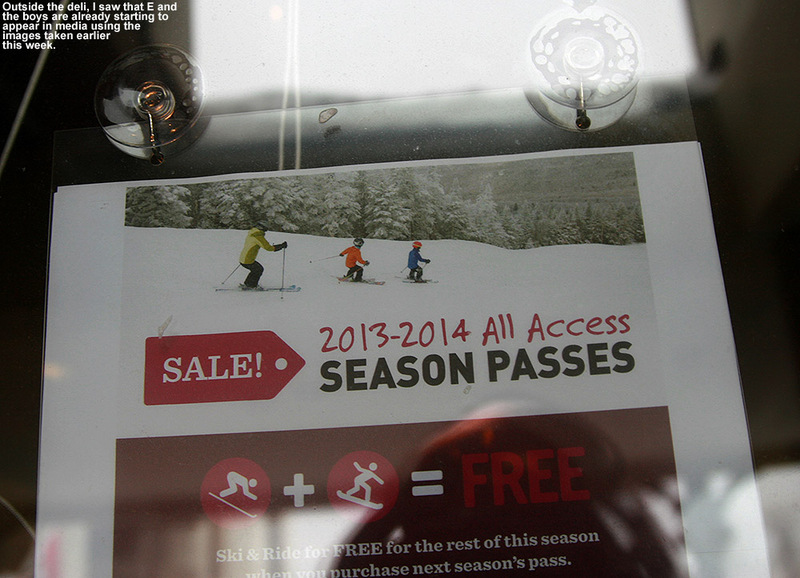 If you’ve ever wondered why people are willing to pay a premium for really high quality alpine/backcountry/ski outerwear, there’s an example. It’s not as if it was even midwinter cold (somewhere in the 20s F), but with the snow guns added in, there was just so much liquid being blasted at you on the strong winds. Gear was thoroughly put to the test today. The skin track from the guy who was just a few minutes in front of me had absolutely vanished in that short amount of time. All I could think as I struggled up that final pitch was that if I was ever going to Tweet something at that point it would have been #itsbrutaloutthere. It was a major relief to be able to get out of the wind, snow, and the roar of the guns under the deck of the Cliff House. That last number there from the Cliff House is just an estimate because as is often the case, the wind made it really tough to find a representative spot for measurement. Anyway, as much as that last, wind-exposed stretch of Upper Gondolier was brutal on the ascent, the skiing was actually fine. But, just below that on Chin Clip was heavenly. 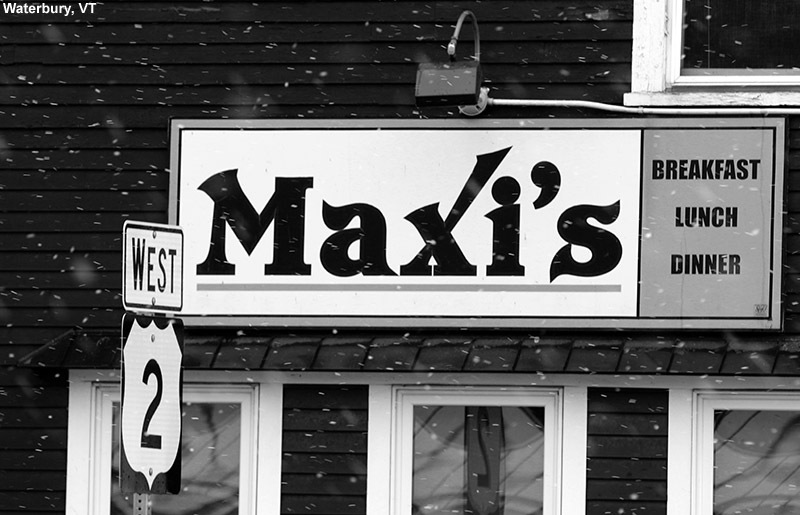 The air was calm, the noise of the snow guns was gone, the plentiful flakes falling form the sky were friendly… and then there was that snow. 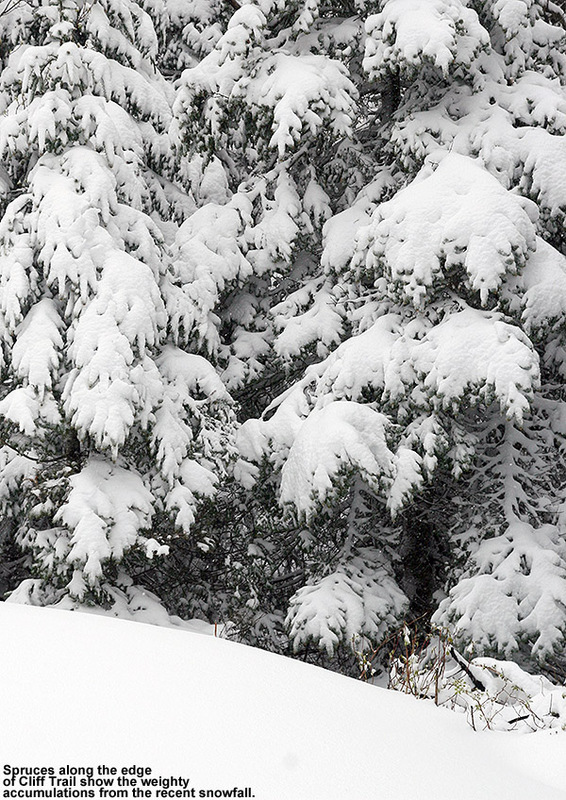 There’s so… much… snow. Oh man, talk about a thorough resurfacing. I actually felt bad on the ascent for anyone that wasn’t skinning up because if you were trying to boot pack through this storm’s bounty, you were doing a lot of work. There’s no walking though airy dendrites out there right now, this is hard-workin’, blue-collar stuff that’s just been put down. 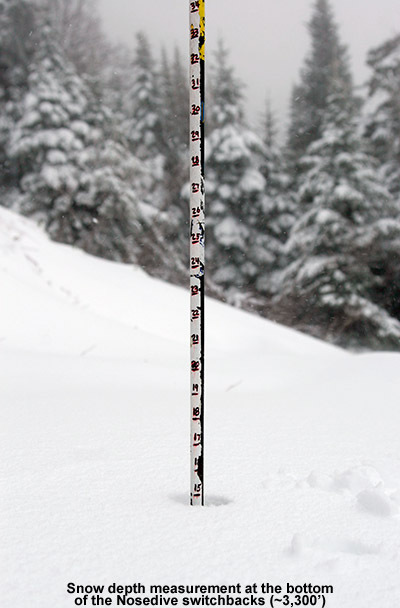 Powderfreak is estimating this storm’s likely going to leave a couple inches of liquid equivalent all together. That’s a season starter right there. On my ascent I’d chatted with another guy near the bottom on Chin Clip Runout who was just coming down, and he said he never touched a thing below the snow… and he wasn’t kidding. 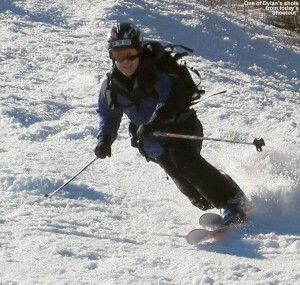 On 115 mm boards I’d say I was sinking in about 8 to 10 inches on hard pressured turns on steep terrain. So you can imagine up high where there’s 20 inches of new stuff plus an old base below that, you aren’t touching anything. 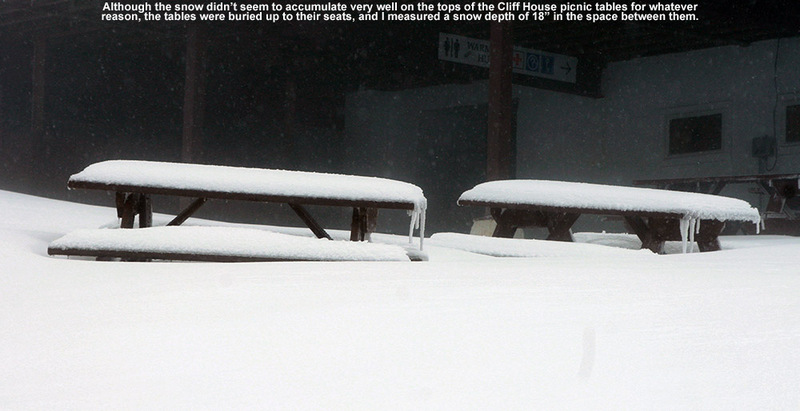 Even back down near the base elevations though, where the snowpack was dropping below a foot, there were no issues. The turns certainly weren’t bubbly champagne today of course, but they were like being out in one of those freshly-fallen Sierra storms without any excess moisture in the snow, where the flakes are just small and the accumulations are dense, but the powder is great. I actually found a bit of upside-down snow at times on my descent, no doubt due to some changing densities throughout the storm, but even for Tele turns it wasn’t too notable within the scope of the overall snow that was available. Snowy views of the mountains on the drive home. On the way back down into the valley on my drive home, I’d say that in general a bit more snow had accumulated during the morning/midday, but you could tell that the snow was struggling to accumulate too quickly with temperatures right around or slightly above the freezing mark. Surprisingly, back in Waterbury Center and Waterbury, there were very sparse accumulations if any, but then accumulations picked back up again once I head toward the house and into the mountains. The weather pattern is actually looking active and potentially snowy going forward, so we’ll see what Mother Nature wants to give us. It would be really nice to get in even an average December after the past three running in the range of 50% of normal snowfall. Even normal would feel quite snowy with the way things have been the past few seasons. I was a little concerned about the potential ski conditions at Stowe today based on what I’d seen at Bolton Valley in the morning, and asked E if she was thinking of cancelling the BJAMS ski program in the afternoon. But, she decided that the conditions looked reasonable enough to keep it scheduled and avoid having to do a make-up day next weekend. 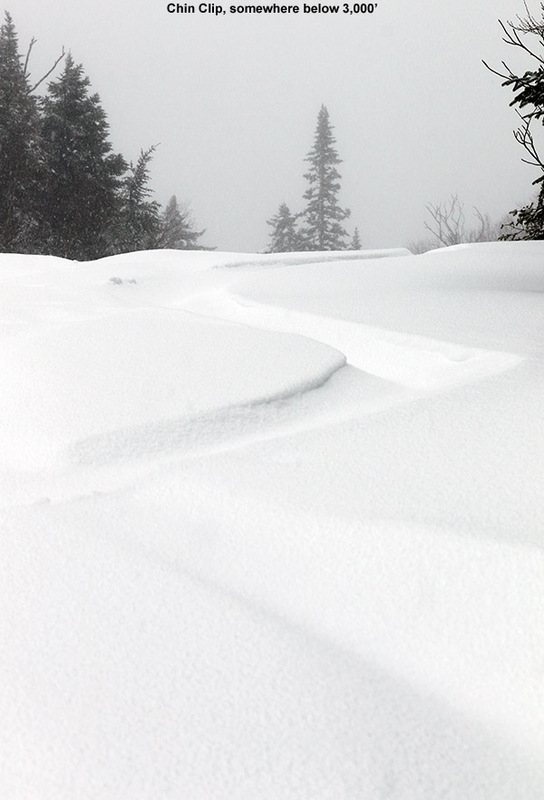 It was definitely the right call, because by the time we got to the mountain, any precipitation had shut off, and it looked like the conditions on Spruce Peak were excellent. 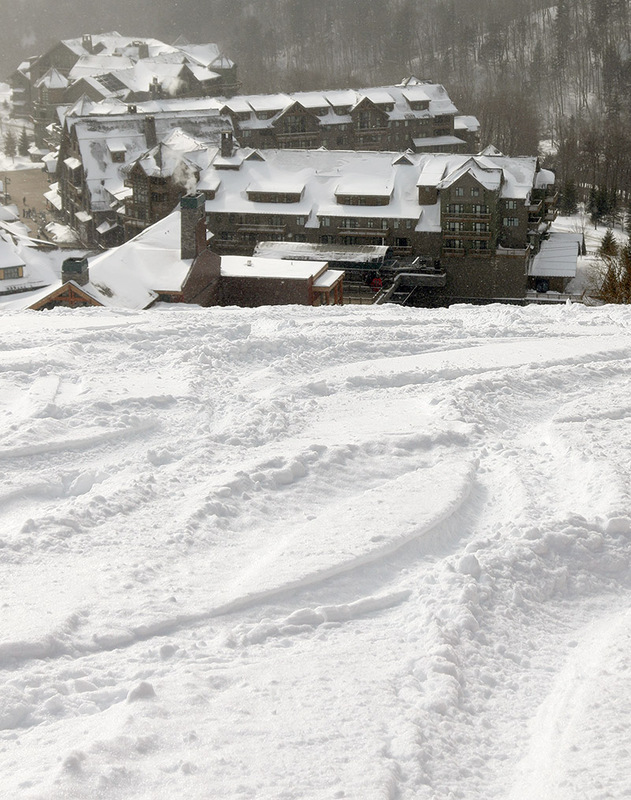 At Bolton valley in the morning, the lower half to two thirds of the main mountain was the place be, with those smooth turns in the fresh shot of dense snow. 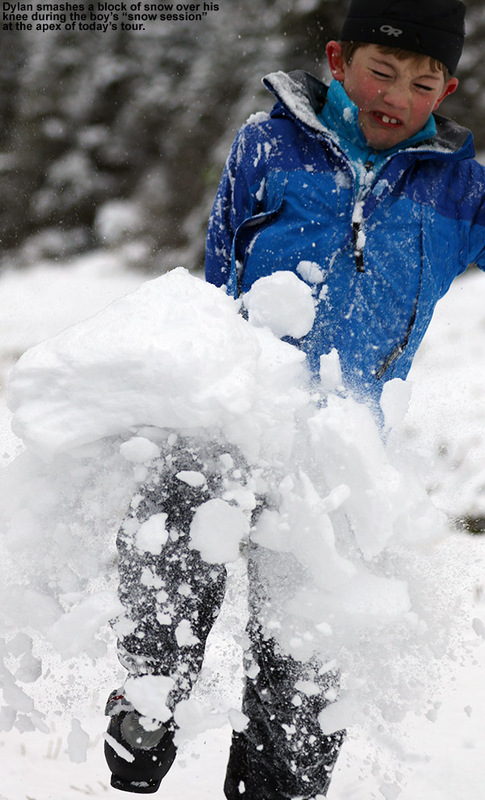 You generally wanted to be somewhere underneath the 2,500 – 2,800’ elevation range to get fresh tracks below the more substantial rain crust near the summits. 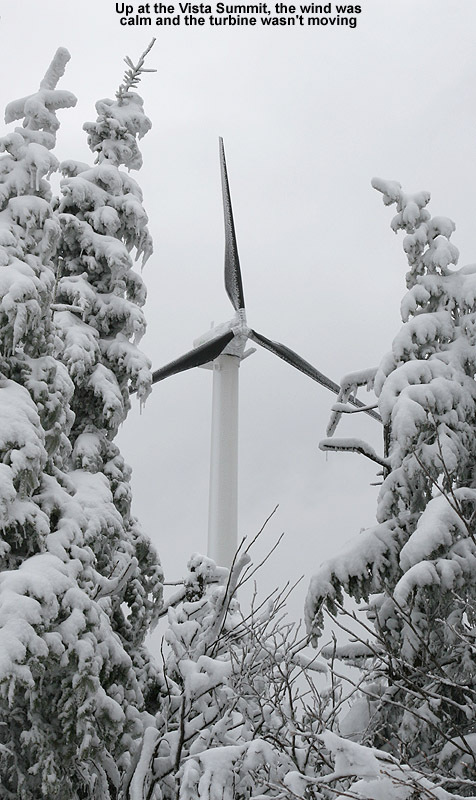 The Sunny Spruce Quad covers the lower half to 2/3 of Spruce Peak, which would be in the 1,500’ to 2,500’ elevation range, so it was likely a good option. Indeed, any concerns about conditions on that terrain were removed when I took an initial run off the Sunny Spruce Quad with the boys. 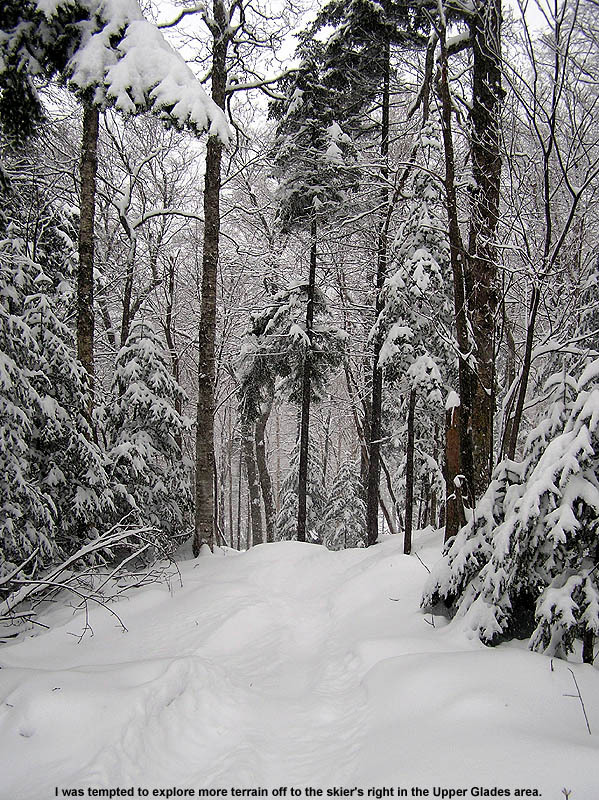 There were still areas of untracked snow on the sides of trails, and it would just peel away beautifully with each turn, just like I’d encountered at Bolton. 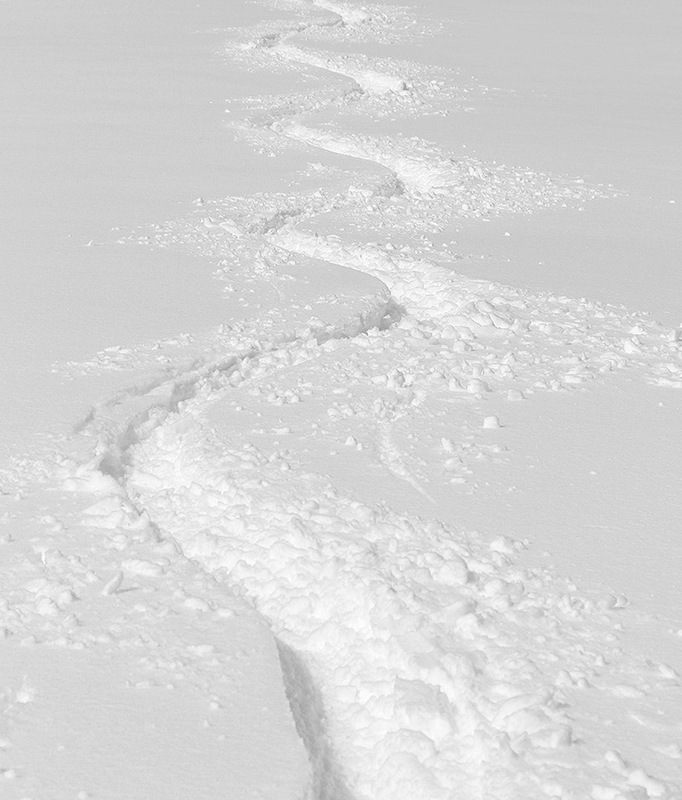 The snow was so dense that it was easily bottomless and you weren’t touching down on any old surfaces. 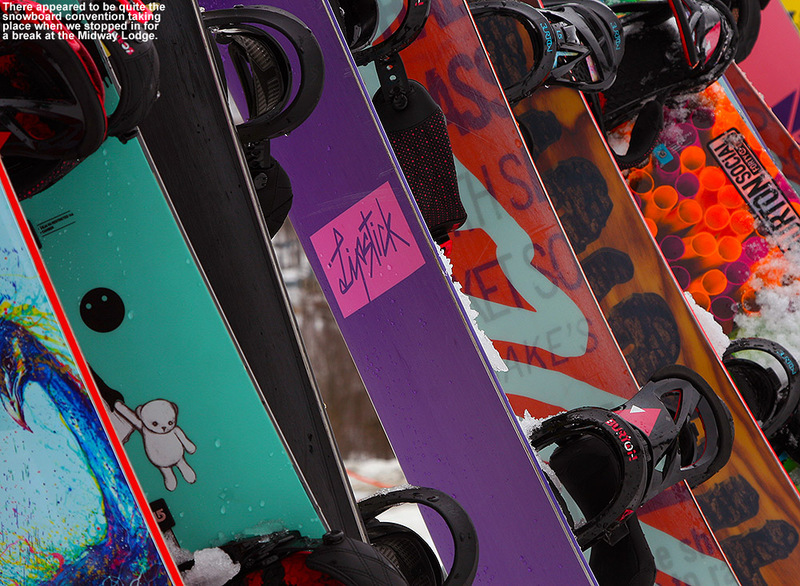 I’d traded in my fat Tele skis for some skinnier alpine skis, and I was definitely wishing I had some cambered fats like the boys did for smearing turns in that snow. We heard reports from others in our ski program who had ventured up higher to the top of the Sensation Quad at ~3,200’, and that turned out to be up into the crust elevations at that point, with ongoing freezing mist/rain that would coat your goggles. In general though, the precipitation that we’d seen in the morning had tapered off, so it was just cloudy for much of the afternoon. 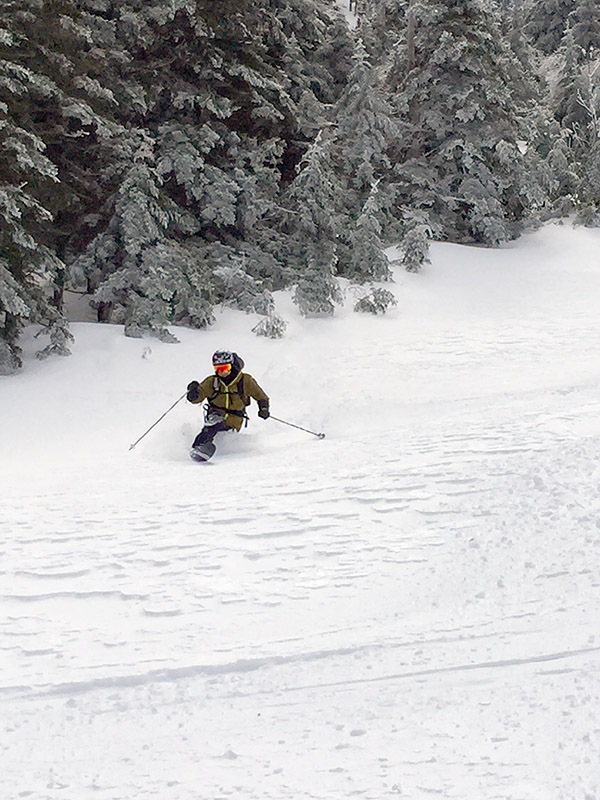 We joined up with E and Claire, who both had some free time to ski since there were so few participants at the program today, and we had a similarly great run off Sunny Spruce. 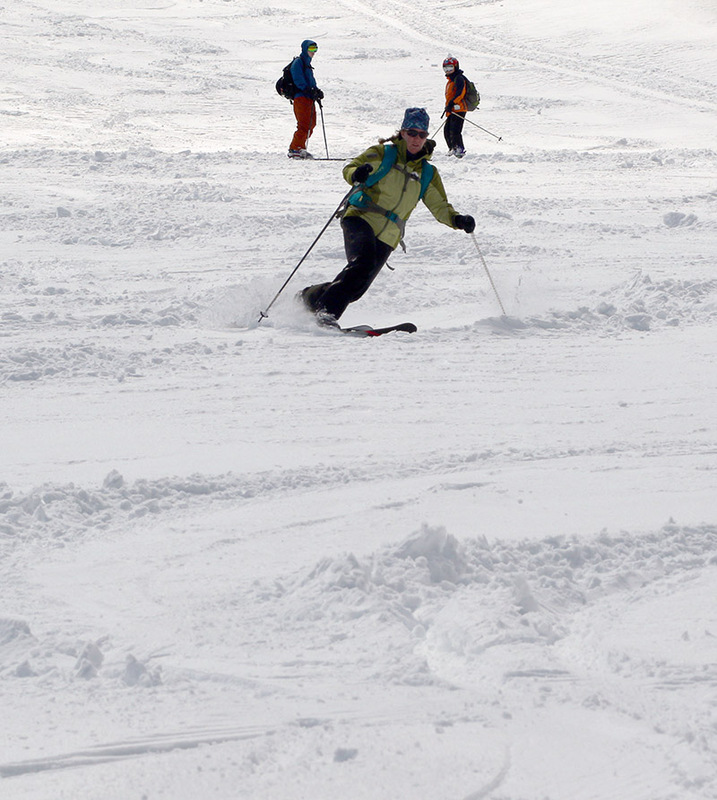 The snow might have been just a touch heavier on that second run. 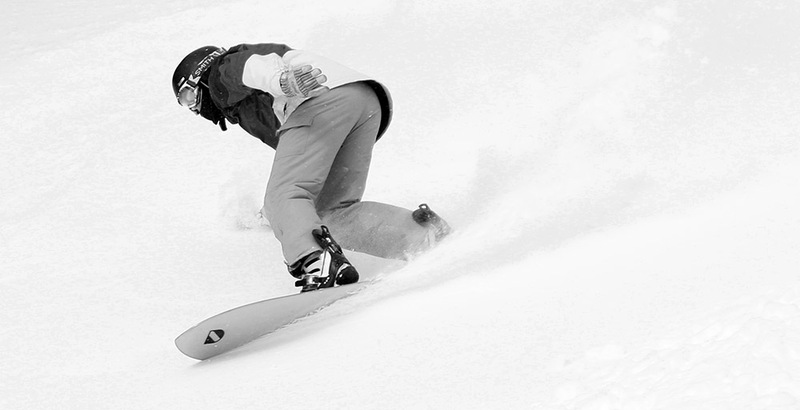 It was either that, or I got that impression after not surfing quite as much untracked snow. 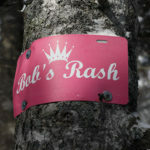 We didn’t stick around too long at Spruce because we were thinking of making a run down the Bruce Trail. 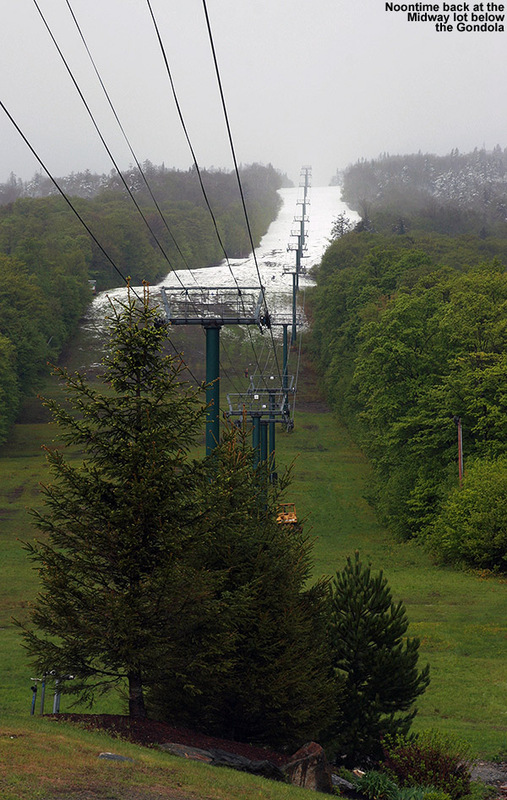 However, when we got to the entrance at the top of the Bruce, we saw that not a soul had skied it. We could have had the entire trail to ourselves with first tracks, but between breaking trail through the high-elevation crust up top, and then potentially dealing with mushy, untracked snow down below, we didn’t think it was worth it. We took a run down Hayride instead, which had excellent, soft snow. Later, when we headed up to the top of the Gondola at ~3,600’, we could tell that the freezing level had definitely risen to bring those higher elevations more into play with respect to softening. You still didn’t want to break fresh lines up there because of the substantial crust, but stuff the people had skied was in great shape by that point and the on piste runs were excellent from top to bottom. We had great Perry Merrill and Gondolier runs; you could just carve so hard into the snow and it would hold and push right back. In between we had a good break at the Midway Lodge, where everyone got to rest those legs that were pushing hard through the new snow. 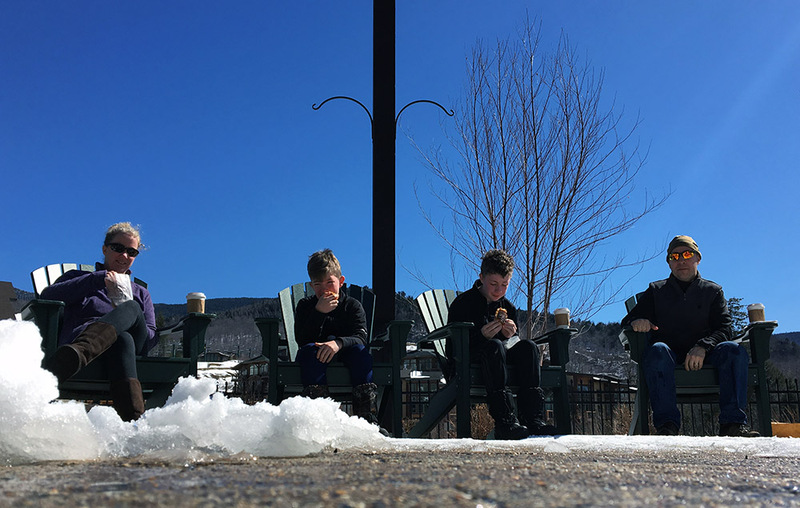 I think that was our first stopover at Midway this season, and although E and Claire don’t get to head over there much with their usual ski groups, I let them know how quiet it typically was if they were looking for a peaceful place to give their students a ski break. 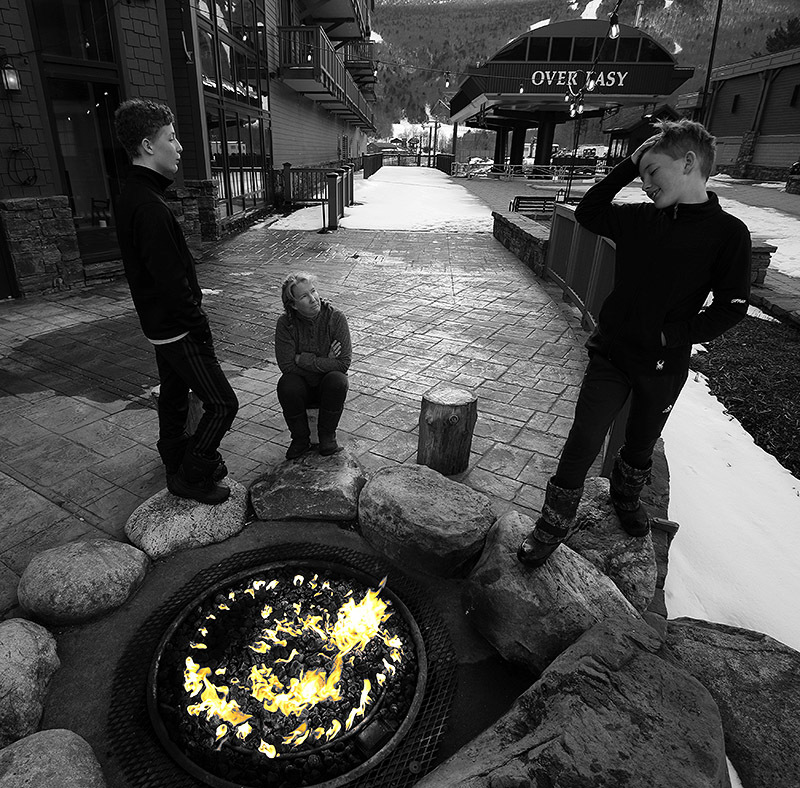 We got some snacks and hung out by the fire, and unfortunately I wasn’t able to find any of Mitzi’s granola to buy. I mentioned it to Claire, and she pointed out a woman over by the ticket counter who was in fact Mitzi herself. 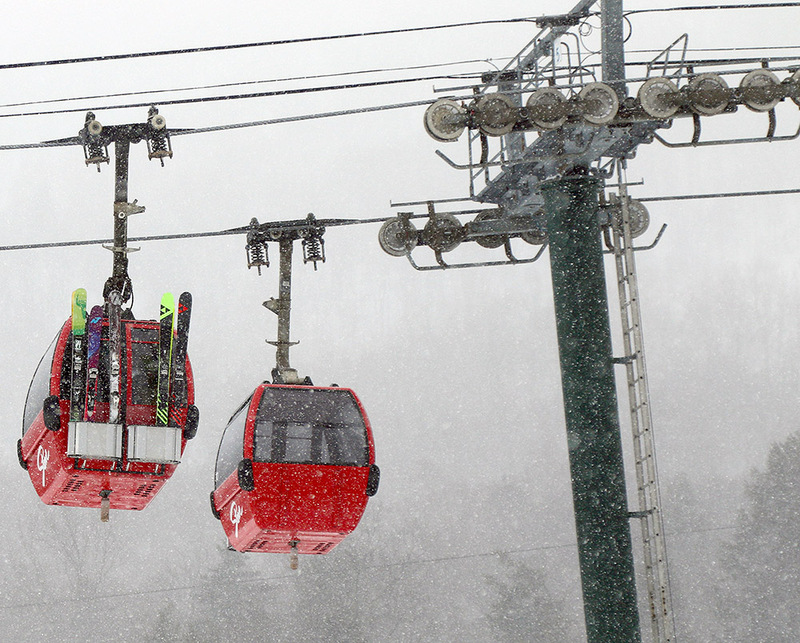 On our last ride in the Gondola around 3:30 P.M., we were noting some sleet coming down. Normally that’s not a great sign relative to pure snow, but in this case it was a sign of some colder air somewhere up there in the higher elevations. 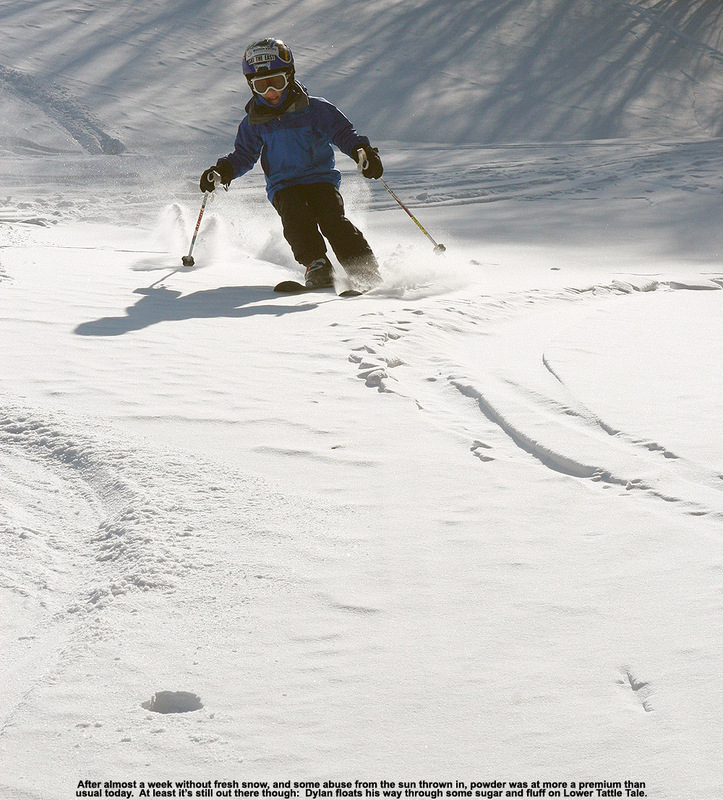 It was approaching 4:00 P.M. when we returned to Spruce Peak, but the boys managed to squeeze in one more run before the end of the day. 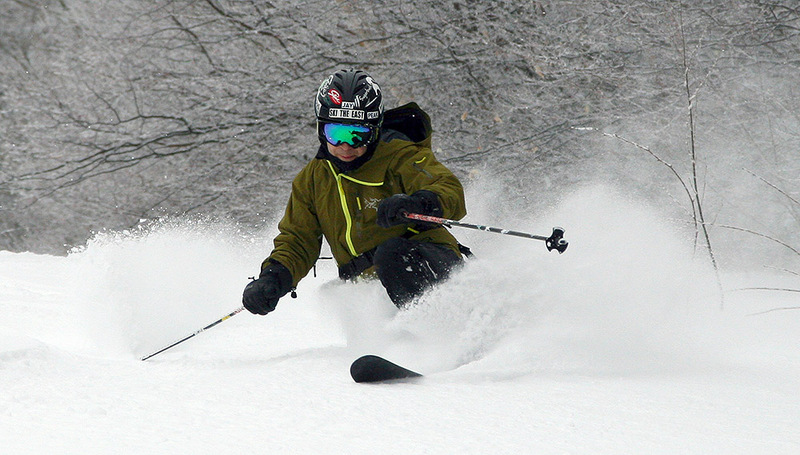 Despite this past storm not being 100% snow, the conditions came together in a great way nonetheless. We may have some additional chances for snow coming in the next week or so, and we’ll have to see what kind of snow we’ll get out of them. 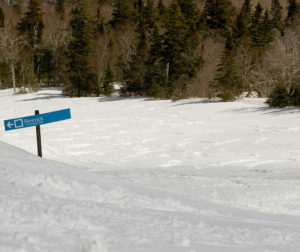 Whatever the case, the base is in great shape for a nice long continuation of the season as we head into April and May. 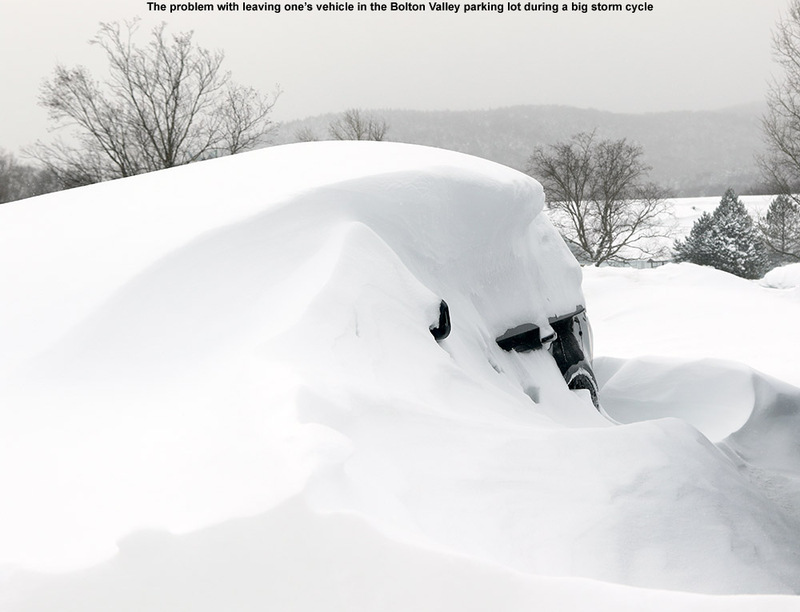 For the past several days, the meteorologists and weather enthusiasts in the New England Regional Forum at American Weather have been talking about a late-season snowstorm with the potential to unload on the northern parts of New York and New England. Around mid month, a thread discussing the Memorial Day Weekend weather was started, and even at that point there was a suggestion that the weather could be cool. However, by Thursday, just a couple of days before the weekend, it was obvious that a late-season snowstorm was developing, and the discussion began to focus on just how much snow the Northern Greens were going to get. I hadn’t been following the weather too closely, but when I stopped in to check the board and found out about the impending snowstorm in the local mountains, my interest was definitely piqued. 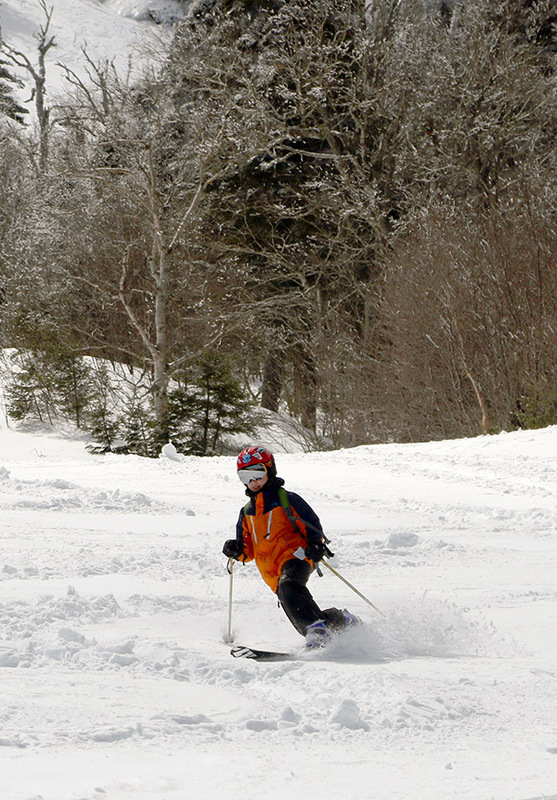 We spent last weekend skiing in spring snow on Mt. 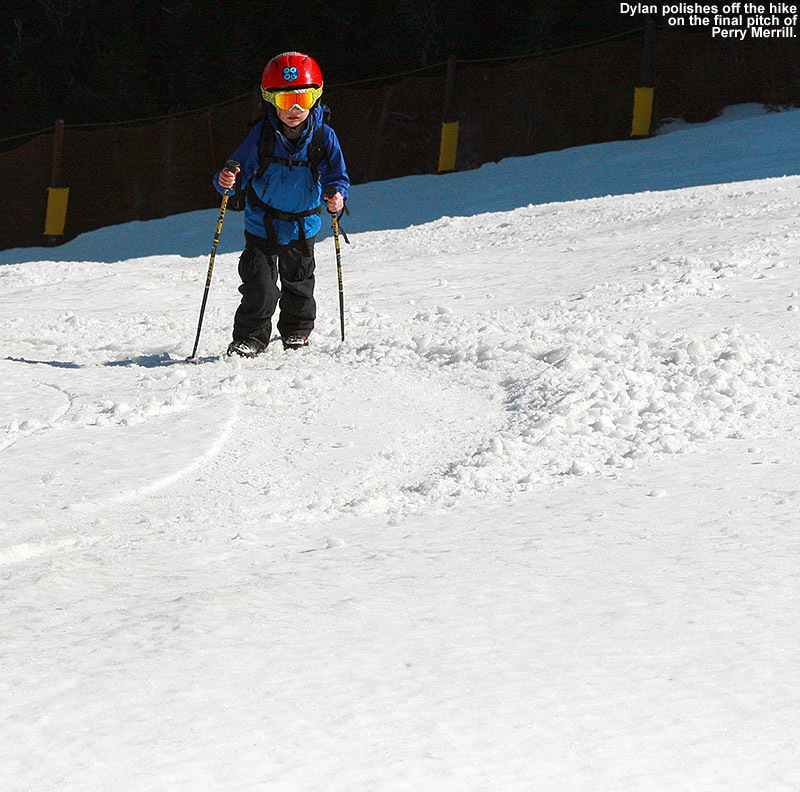 Washington, and it began to look like this weekend would bring winter skiing on Mt. Mansfield. 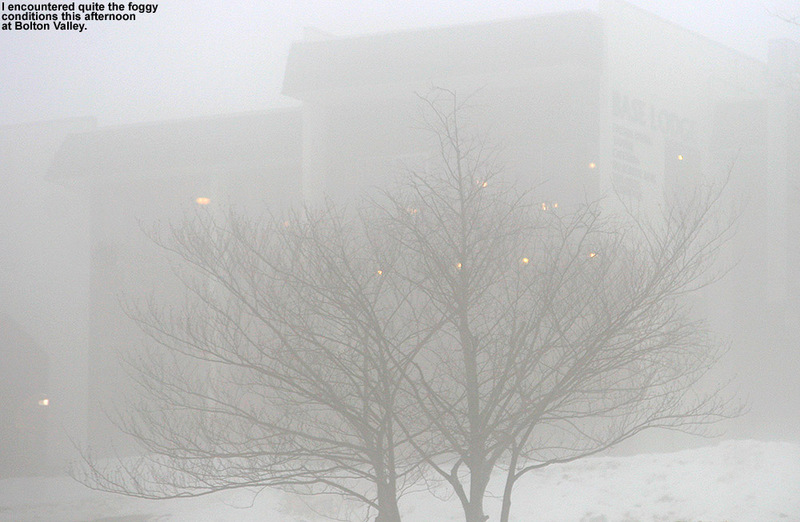 Saturday arrived with a nor’easter developing just like the weather models had suggested. For folks that had outdoor, warm-weather plans for the big holiday weekend, you almost couldn’t find a nastier combination of weather. Temperatures were in the 40s F, and there was plenty of wind and rain. We wondered if we were going to have to turn the heat back on in the house. 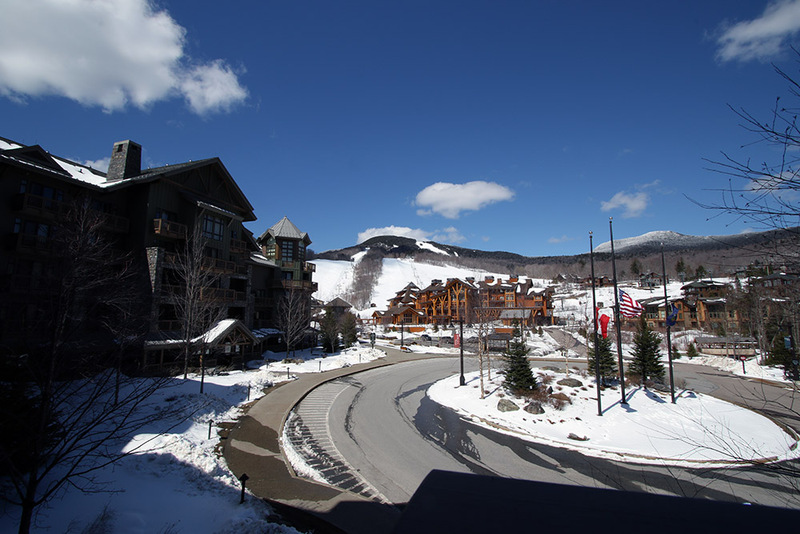 Reports began to come in about the snow in the mountains, and by mid afternoon, Whiteface was already reporting that they had received 18” of new snow. 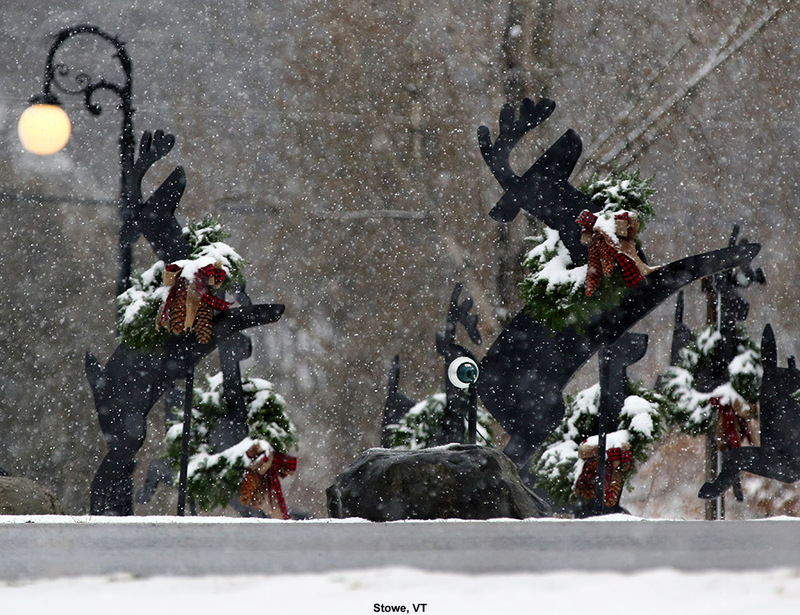 As the afternoon wore on, even valley temperatures fell down well into the 30s F in many places in New England, and fairly low elevation spots began to report snow mixing in with the rain. Although we weren’t getting any snow down to the low elevations in our area, we lost power from about 8:30 P.M. to 9:30 P.M. for some reason, so we headed off to bed early and decided to see how things were going in the morning. 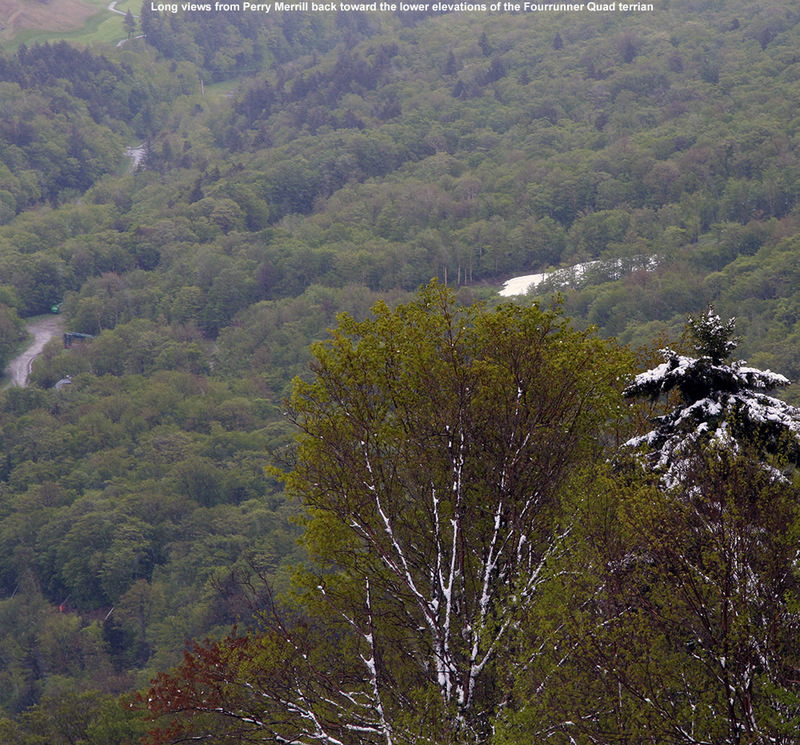 Snow closed down the road through Smuggler’s Notch today. I made my morning CoCoRaHS observations at 6:00 A.M., and after checking back in on the weather board and looking at some of the mountain web cams, I decided to head to Mt. 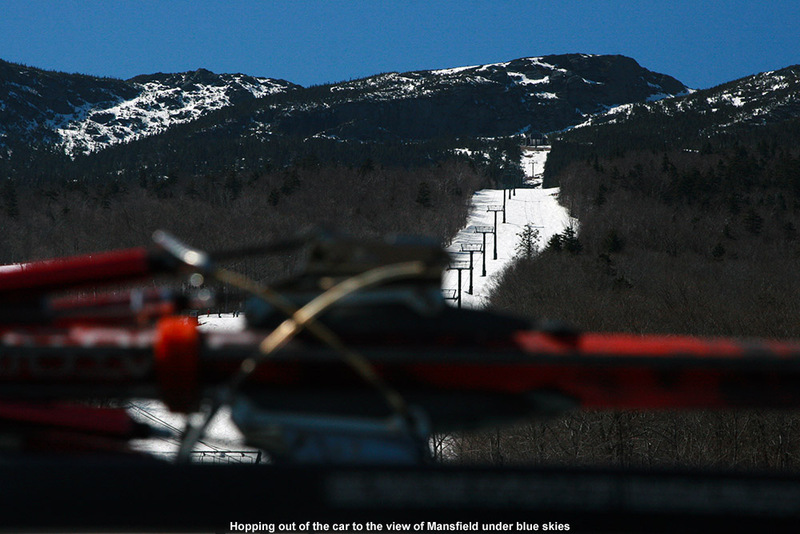 Mansfield for a ski tour. 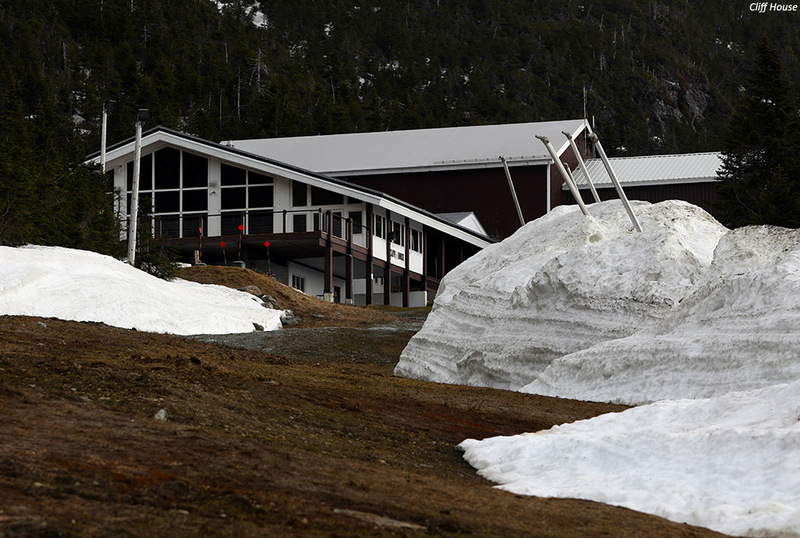 I couldn’t tell quite how low the snow line had gotten, but it was still below freezing in the higher elevations, and the precipitation had continued through the night. 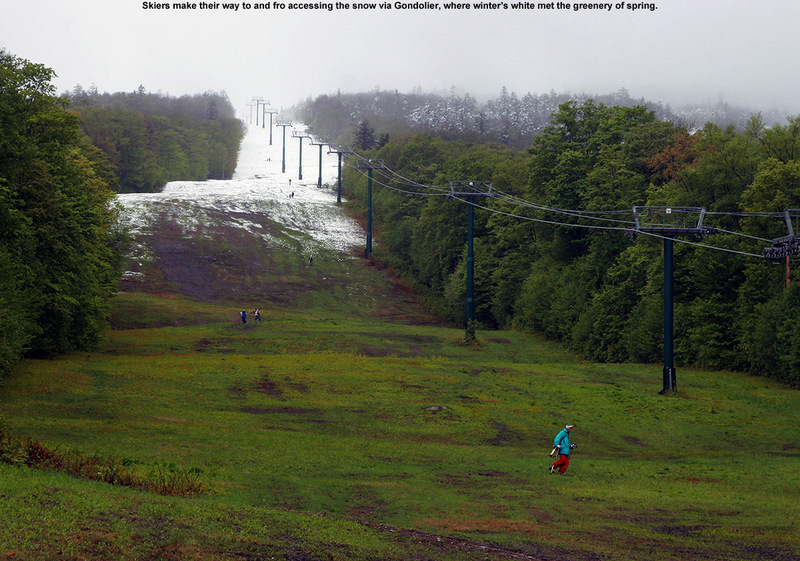 There was a good chance that a nice shot of snow had accumulated on Mt. Mansfield. I didn’t try convincing E or the boys to try to join me, since they were all still in bed, so I got into my ski clothes, let E know that I was on my way, and loaded up the car with my gear. I don’t typically find the ski gear vying for space with the baseball stuff in the back of the car, but it definitely was today. 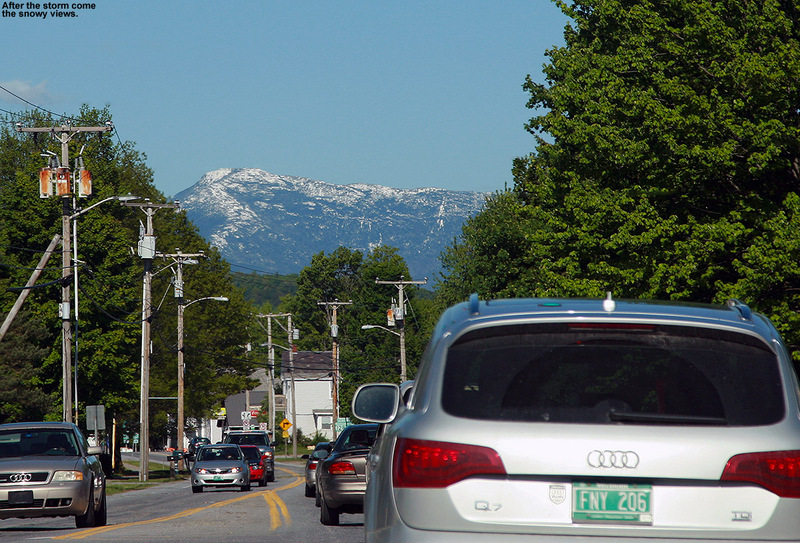 I headed off to the mountain around 7:30 A.M. or so, and temperatures throughout the mountain valleys in the Waterbury–Stowe area were in the lower 40s F on my drive. 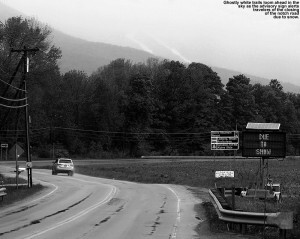 The precipitation was generally light rain until roughly the point where the electronic sign indicates the status of Route 108 through Smuggler’s Notch, and not long after that, the rain became much heavier. The sign, by the way, read “NOTCH ROAD CLOSED… DUE TO SNOW”. The road through the notch tops out near 2,200’, so clearly the snow was accumulating at that elevation on paved surfaces. 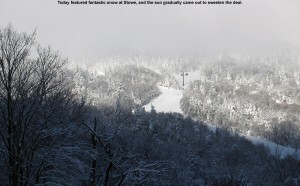 The temperature remained in the lower 40s F until that final rise above The Matterhorn to Stowe Mountain Resort, where they dropped into the upper 30s F.
I parked at the Midway Lodge (~1,600’), where the temperature was in the mid to upper 30s F, and the precipitation was generally snow, but certainly some rain as well, and the snow that was falling was of course incredibly wet. It was pretty nasty at that point, with 25 MPH winds and driven wet snow/rain. The snow wasn’t quite accumulating there, but it was close, and you could see the accumulations just a few hundred feet up the trails. The weather was nasty enough that I left my lens hood on my camera in its protective orientation, even when it went back in my pack. I rarely feel the need to do that, and typically flip it back around for storage, but that speaks to just how wet and windy that snow was to make me take that extra step to minimize the amount of precipitation getting on the lens filter. We stopped our ascent at 3,300’ because as we approached the switchbacks at the top of the trail we got some beta from a couple of skiers coming down Nosedive – they indicated that everything above that elevation in the switchbacks was scoured and really not worth it, and indeed that was obvious once we got to the landing below that final switchback at 3,300’. I’m going to call the average snow depth there 10” to be on the conservative side, but there were plenty of areas with 12”-15” of snow; there was just variability due to the effects of wind deposition. 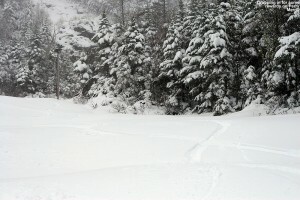 I stuck my measurement pole right in the snow in the center of that landing, and found 15” of snow depth. 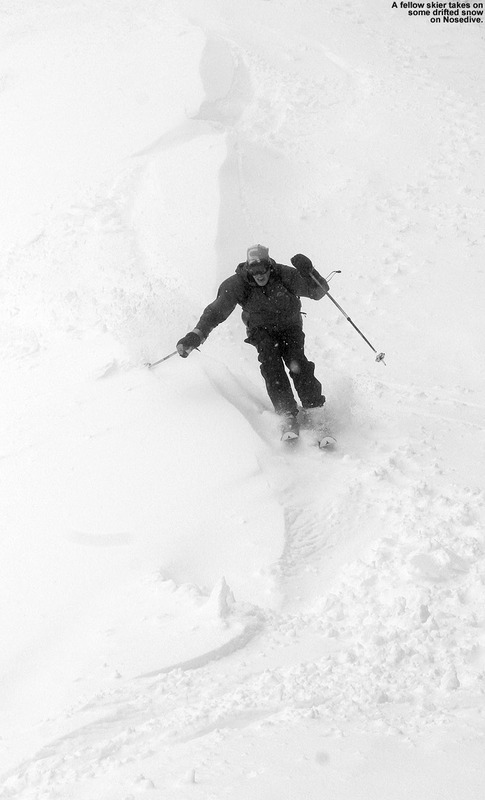 The guy that had ascended with me headed up just a bit higher to catch some turns along a drift of snow, so I pulled out the camera and got some action shots as he made his way down. 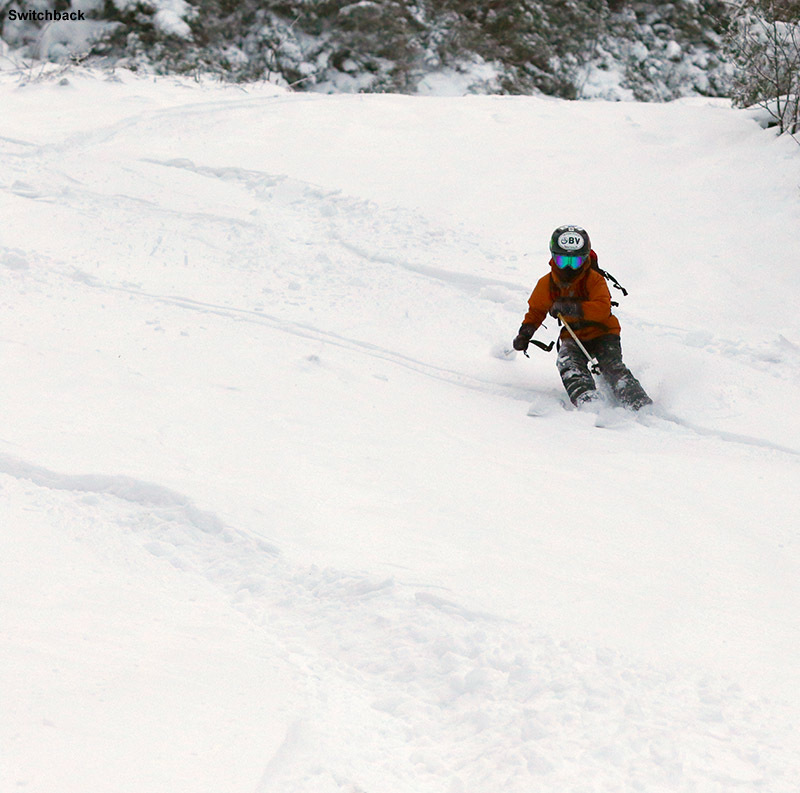 I didn’t get his name, but he had quite a blast ripping up the powder on Nosedive today. Before beginning my descent, I downed a packet of GU Energy Gel to see if it would provide that extra boost of energy to my legs to permit proficient and aggressive Telemark turns. 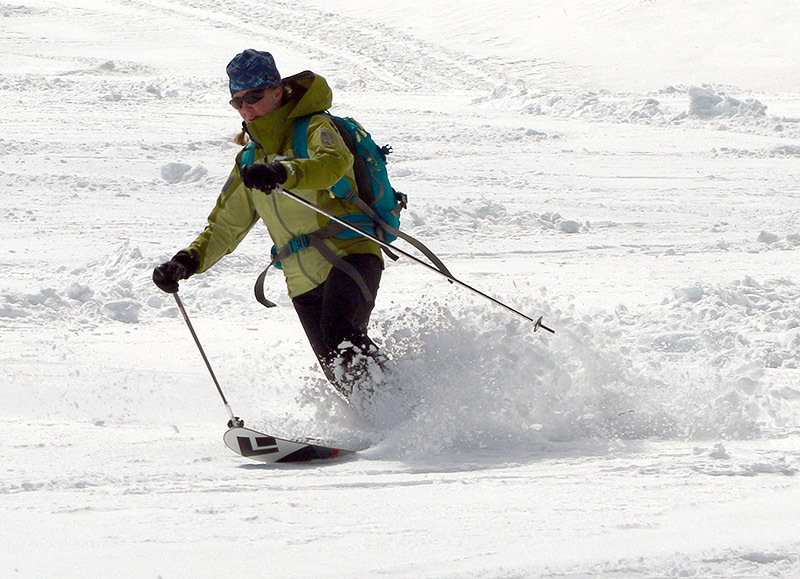 I’ve noticed that after fairly long and/or quick ascents, my legs are often still recovering, and not to the stage where they can handle a lot of rigorous Telemark skiing right away. 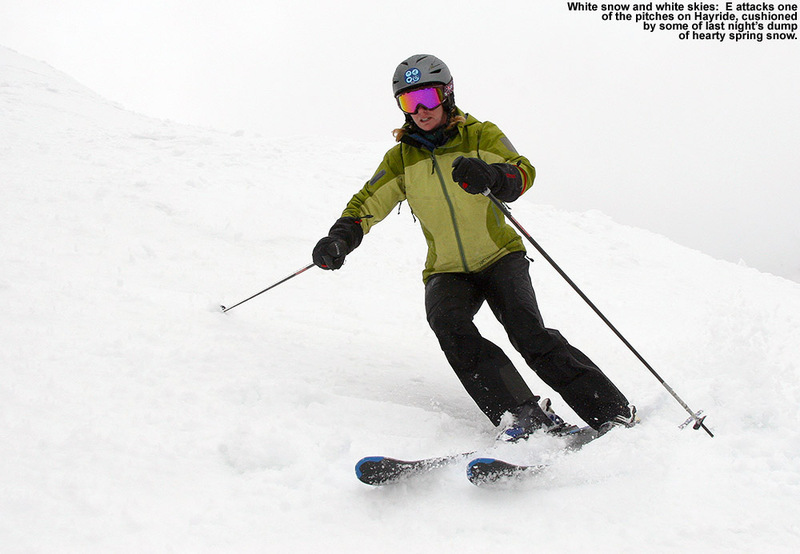 Alpine turns are typically no problem, since they’re easier and more stable to begin with, and after decades of alpine skiing, my muscles have the memory to really let them do it efficiently. 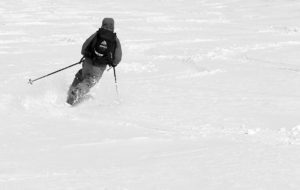 But those Telemark turns take a lot more work, and it seemed like a little extra boost of quick energy would get me where I needed to be. 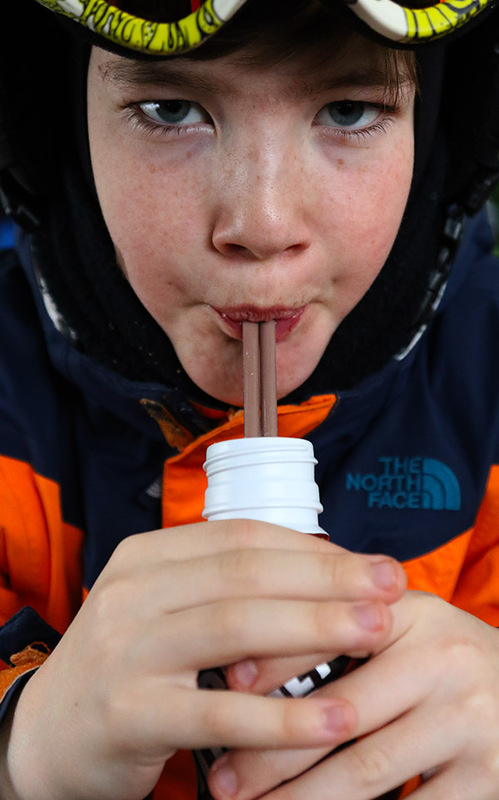 So, I took a cue from the boys, who like to have a GU when they’re starting to fade while we’re biking or skiing – the Vanilla Bean flavor is a favorite among all of us. I usually don’t find that I need to worry about having enough energy on outings with the boys along; the pace is so slow that E and I usually don’t get drained. The boys certainly push themselves though, often needing some sort of recharge due to their smaller energy reserves, and when that’s the case, it’s GU to the rescue. On bigger, faster paced outings by myself though, I also feel the drain, and today I wanted to give a recuperative GU shot a try. I had the GU just a few minutes before my descent, and it absolutely worked. 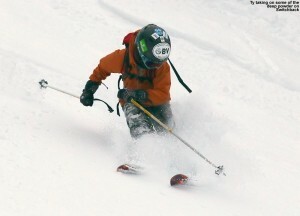 It helped give my legs that quick energy that they craved, and they had no trouble making Telemark turns. It was great having maximum powder to drive the legs, and while there’s no way to know exactly how my legs would have performed without the shot of GU, it was certainly my hero for today. I can still remember when I first learned about those energy gels back in the early 2,000s when Scott and Troy and their Dirtworld.com mountain biking team would use them. They’d strap them to their handlebars and down one on each lap to keep their energy up. 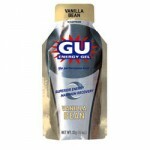 With the way it performed today, I think a shot of GU before each earned descent is going to become part of the routine. As for the snow conditions, indeed there was some leftover base snow on Nosedive, and that offered up great turns, but the new snow itself was extremely dense (probably 12-14% H2O or so) and as long as there was enough of it, there was no need for previous base because it kept you off of anything below. I caught some beautiful bottomless powder on the skier’s left below the switchbacks, and then a lot more on the skier’s right along the edge of the trail. The Telemark turns were definitely flowing, and despite the fact that it was dense snow that could easily have been challenging to ski, it wasn’t. I immediately thought back to that storm last year on April 10th. Mt. 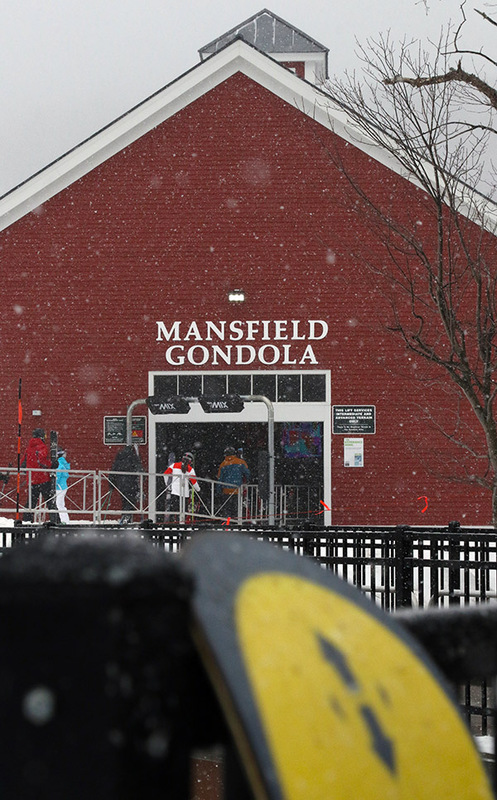 Mansfield picked up more than two feet of dense snow that covered everything, but it was quite a challenge to ski on the Teles. 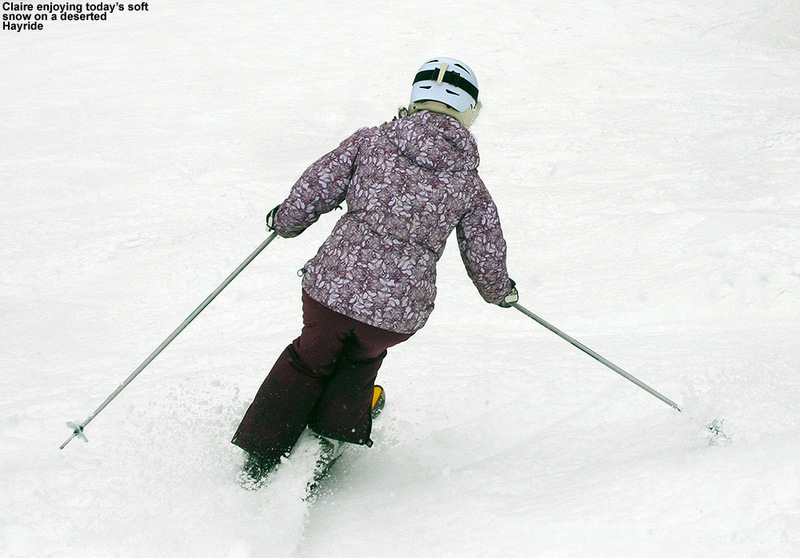 Sometimes you would punch through the snow too far, perhaps with one ski, making lateral balance tough, and fore-aft balance was also extremely challenging. It’s possible that there was snow of varying densities in that storm, with some less dense snow underneath the topmost layer. That’s “upside down” snow, which is typically more challenging to ski. It was after that storm that I really decided that I wanted some fat, rockered Telemark skis for powder, and eventually got the Black Diamond AMPerages. I can only wonder how they would have performed in that storm – they would have been nice today, but being unsure of the snow depths I went with my older Atomic RT-86 midfats, and there were no issues. 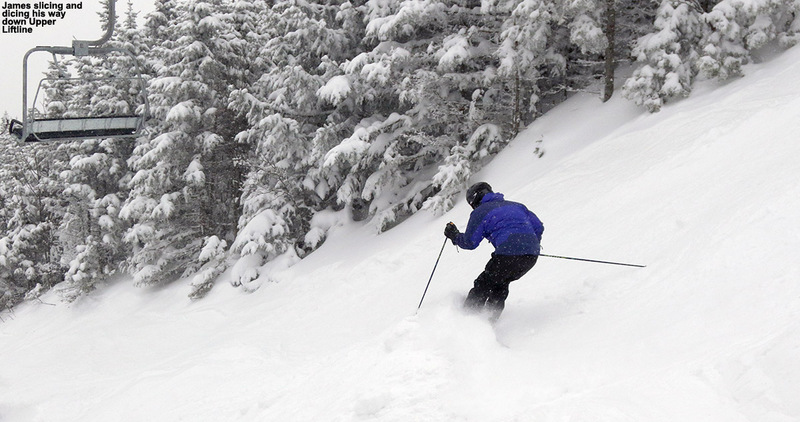 Really, the most challenging aspect of today’s skiing was negotiating areas of thinner snow as you dropped in elevation. 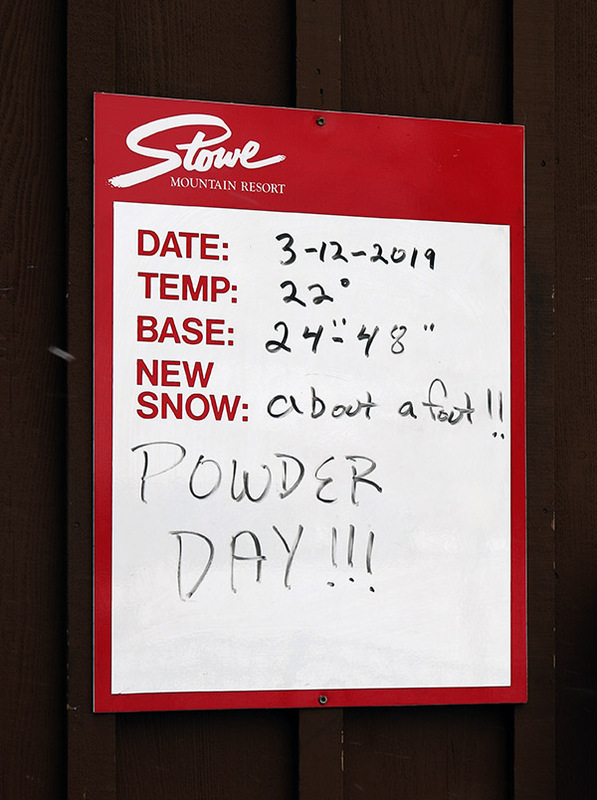 I was actually quite impressed with the quality of some of the powder skiing on Nosedive today, but little did I know it wasn’t even going to hold a candle to what was in store over at the Gondola. I had another GU and got ready for my descent. Even that first steep pitch of Perry Merrill had great coverage comprised of that dense snow. Typically you’d sink in a few to several inches, but at times it was dense enough that you’d be smearing turns right on the surface. It took a moment to adapt when that was happening, but somehow the variability in the turns didn’t seem to disrupt the flow of the skiing – it was just really fun. I almost headed back down Cliff Trail since the coverage was so complete, but there were already a couple of tracks on it, and it’s fairly narrow, so I opted to check out Perry Merrill instead. I was hoping it would live up to the coverage I’d seen on Cliff Trail, and indeed it was just as good, if not even a bit better. 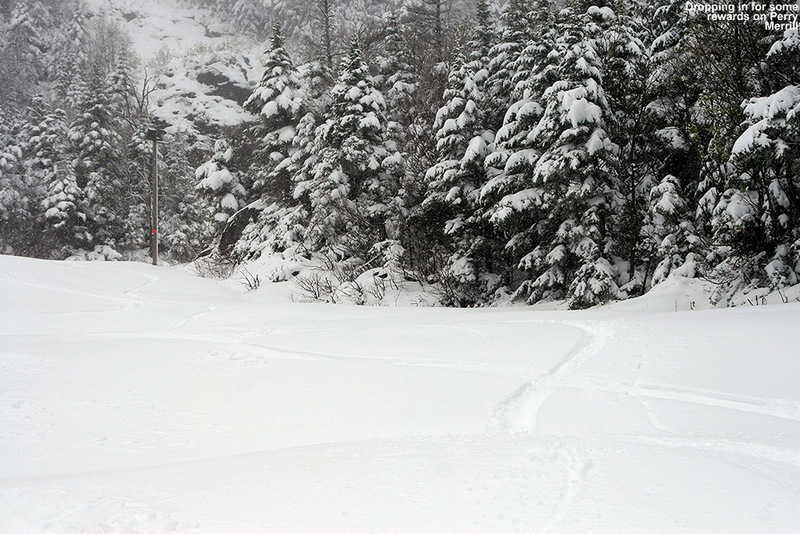 There were plenty of untracked lines to ski, and it was dense, wall-to-wall snow, all the way down to 2,500’. 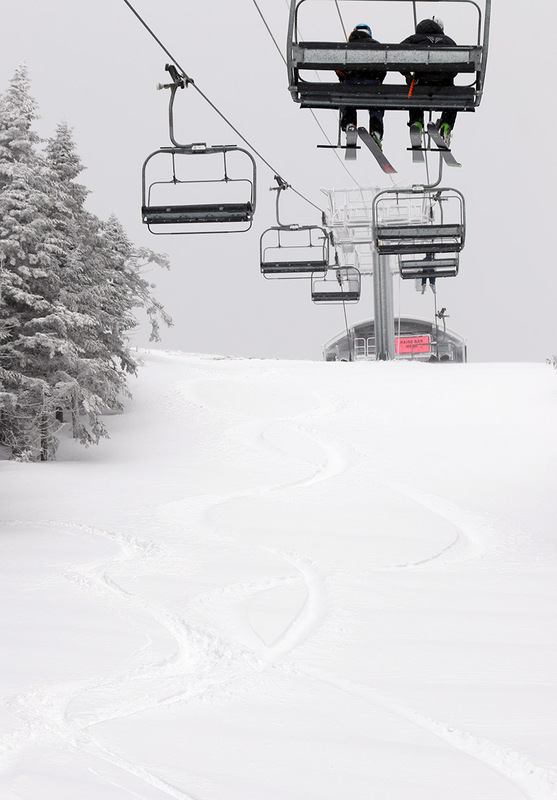 You could do laps up there from 2,500’ to 3,600’ and think it was midwinter. 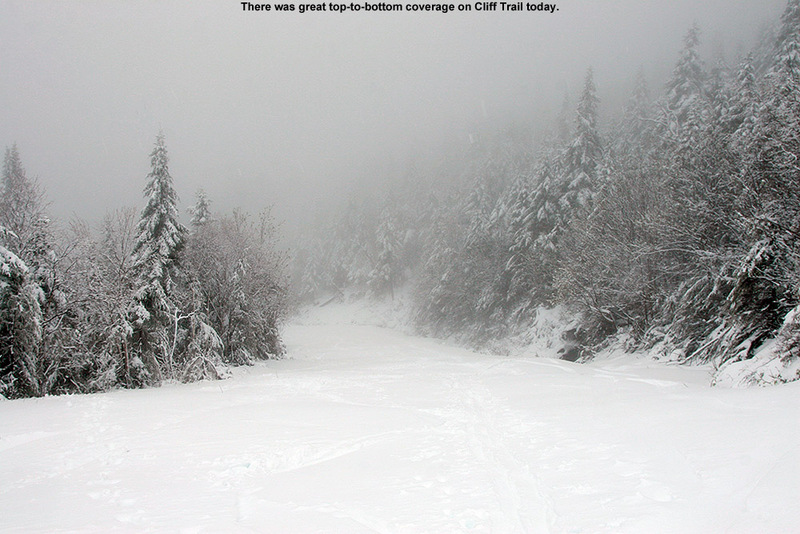 The snow certainly wasn’t fluffy Vermont Champlain Powder™, it was dense Sierra Cement, but it wasn’t wet or sticky. 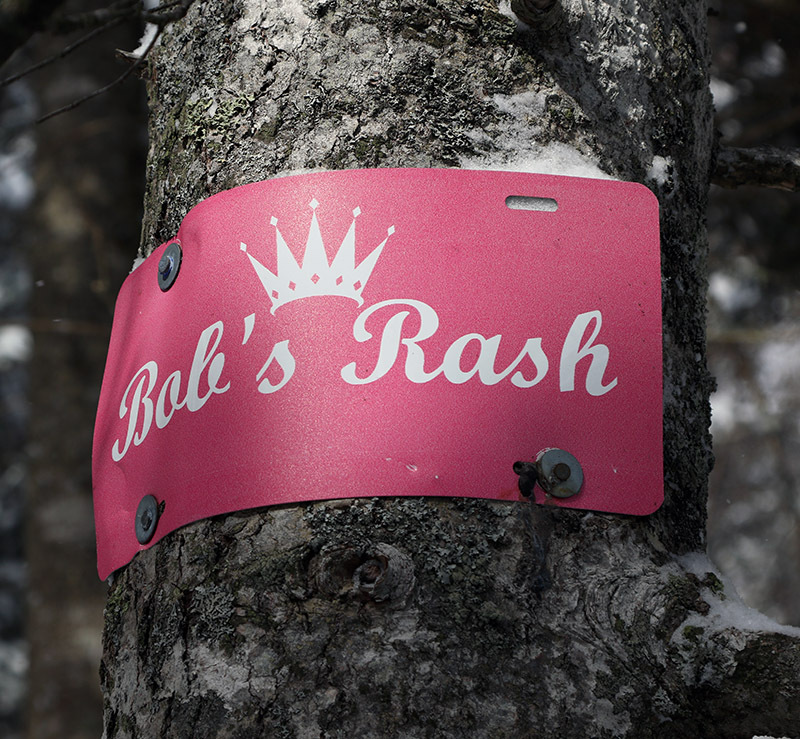 It made for plenty of base and just skied really well – it was right near the top on quality that I’ve experienced relative to many similar early and late-season dense-snow events. Sinking into the snow only a few inches or so was inconsequential compared to the fact that you didn’t have to worry about hitting anything underneath and you could just let it rip. I stopped my descent at around 2,300’, as the snow was down to about 4” and it was getting notably wetter. 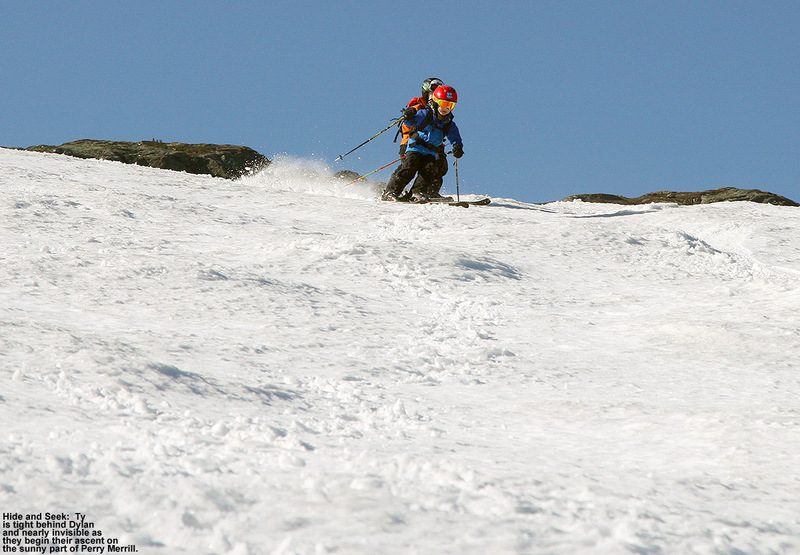 You could probably go down to around 2,100’ easily if you had your rock skis. I hiked down the last 700’ back to the Midway Lodge, and the last vestiges of snow disappeared right around 1,800’ just like I’d seen over on Nosedive. 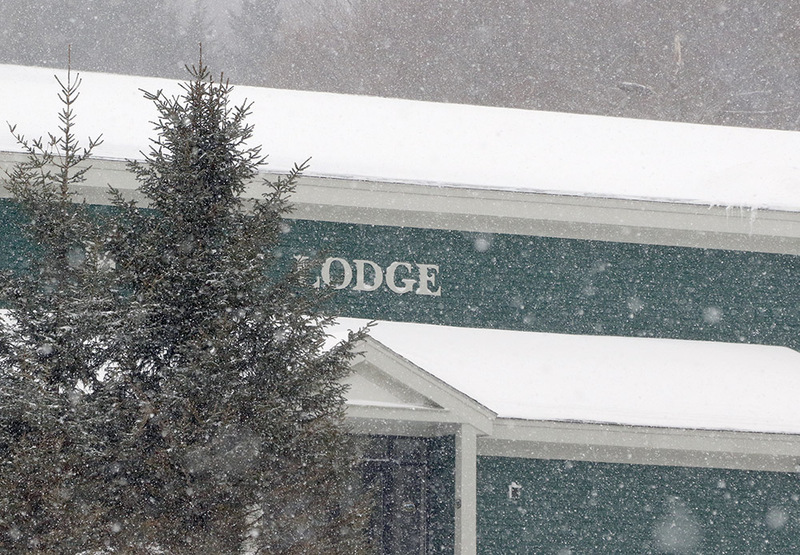 The precipitation was snow down to just a couple hundred feet above the base, and back down at the lodge it was mostly rain with some snow mixed in at times. There were some really good bursts of snow on my descent, even in the lower elevations. The temperature had increased a few degrees to ~40 F at the base, but it was midday at that point, so that was still quite impressive. Overall, I was really excited about how my equipment and supplies performed on this tour. My Gore-Tex did its job in keeping me dry, despite the driving rain and snow. 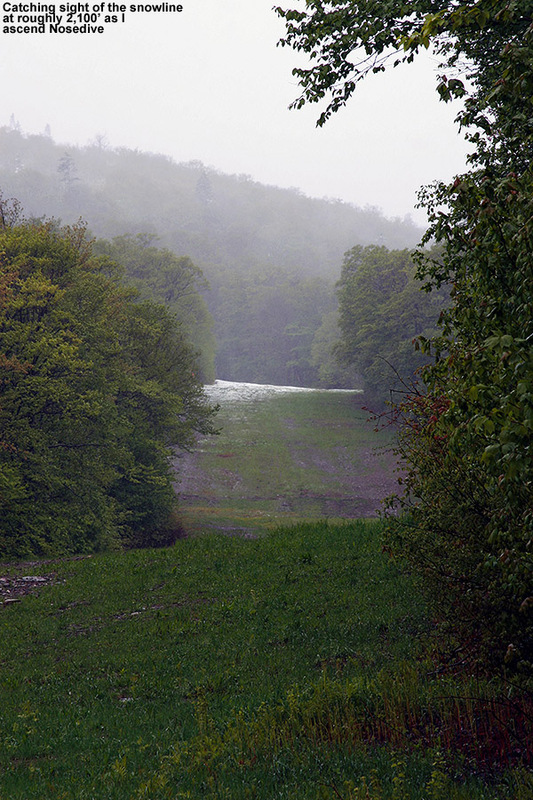 My skins held like glue even in the wet snow, and hiking both up and down in my Telemark boots was a joy. I remembered to put them in walk mode for the walking sections (and put them back in ski mode for the descents) and it was almost like being in my hiking boots. And then there was the GU. 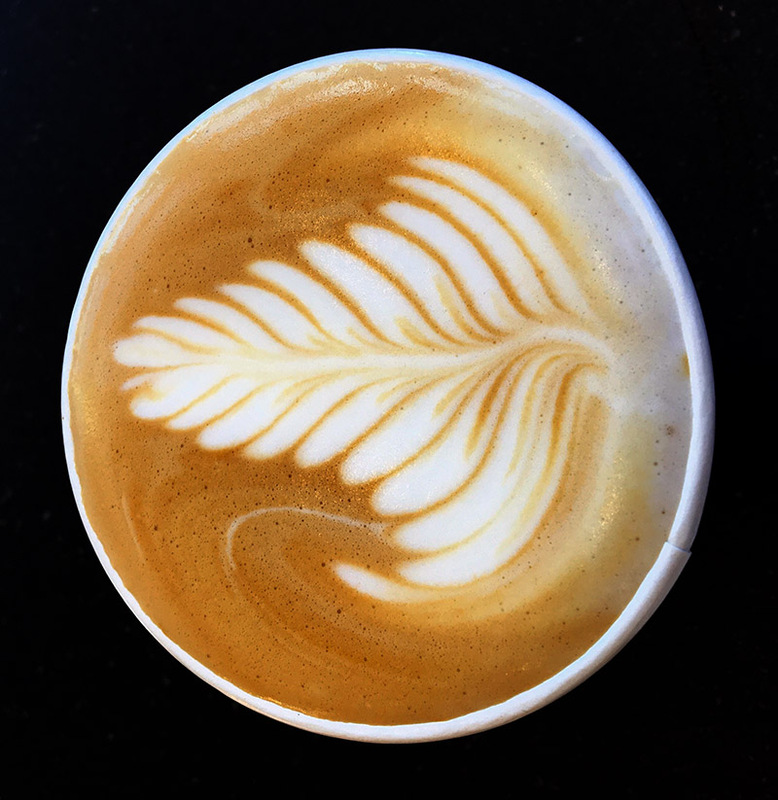 It really quickened my recovery for the descents, and I’m going to be keeping that on the tour menu going forward. The boys won’t be able to borrow GU from me as easily though when they need it. While the GU certainly did its thing, I’m sure my stop off at Dunkin Donuts to fuel up before the tour also helped. I was feeling so great when I got home at midday, that I was ready to go for another round of skiing if E and the boys wanted to. 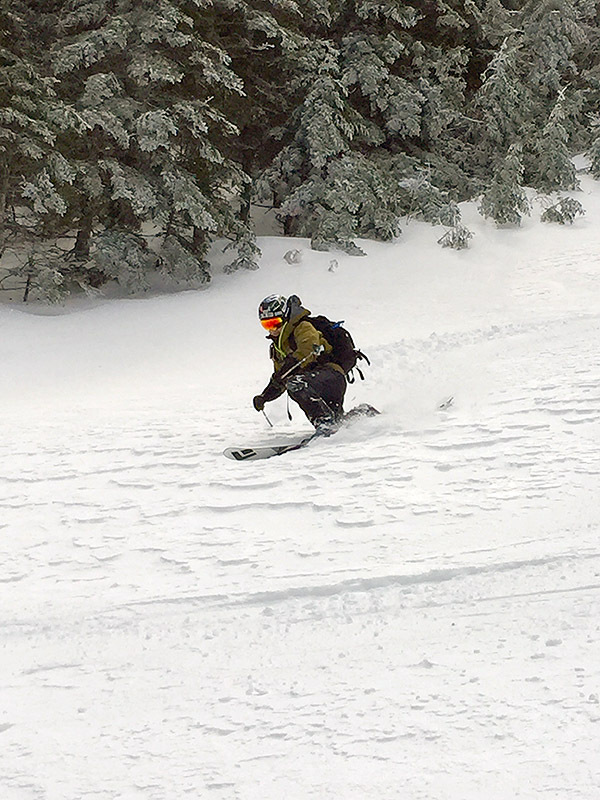 It was still nasty and rainy outside, and not really conducive to doing too much else, but we had some fantastic winter powder skiing sitting up there in the high country. I couldn’t convince them to go though, so they unfortunately missed out this time. We did get some quality time indoors though, which I’m guessing a lot of families were doing this weekend. Ty, Dylan and I had a great round of “The Settlers of Catan” while E did a bit of shopping. 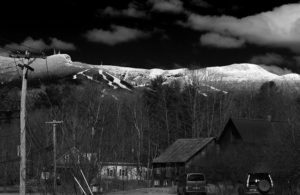 It was quite a storm though, with Whiteface and other areas of the high peaks really cleaning up and putting out some amazing pictures. Monday update: The clouds cleared out today to produce crystal blue skies, and naturally that revealed some amazing vistas of the spring foliage and snow-capped peaks everywhere. Mt. 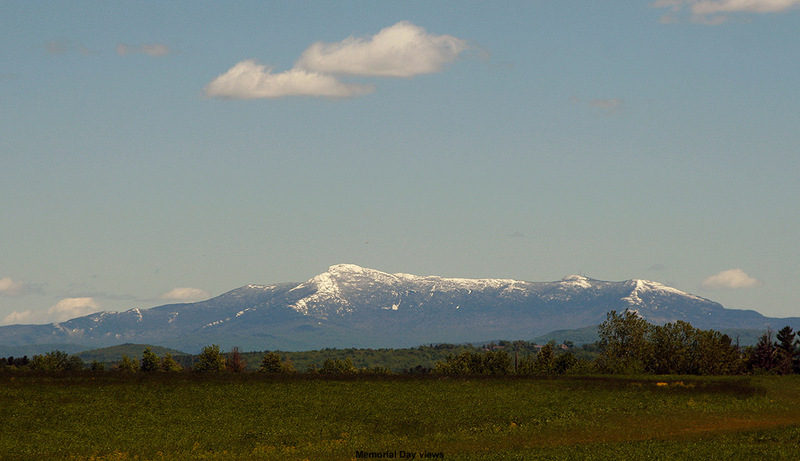 Mansfield and Camel’s Hump were topped with white, shimmering in the strong sun of late May, and the high peaks of the Adirondacks were brilliant. 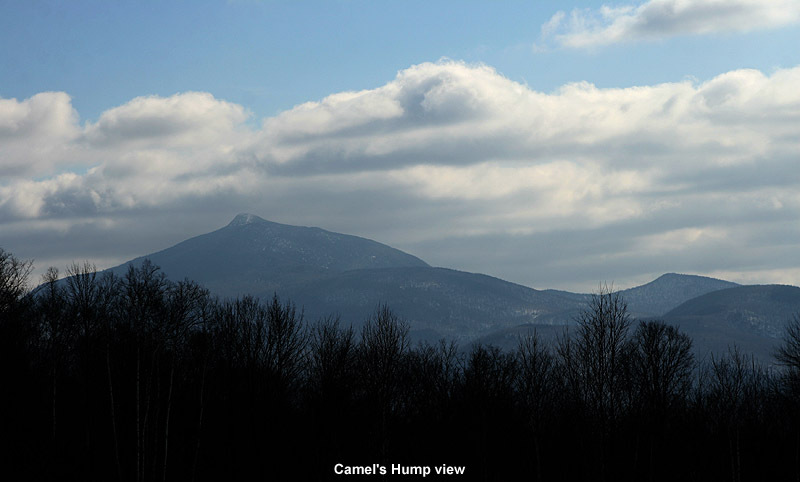 We traveled around from Waterbury to Vergennes to Cambridge doing various activities, so we took in numerous vantages of the Greens and Adirondacks. It turned out to be a spectacular Northern New England Day for the holiday, almost as if Mother Nature was trying to strike as sharp a contrast as possible against the recently departed storm. Dylan doing some work behind the camera today capturing Dad in a turn. 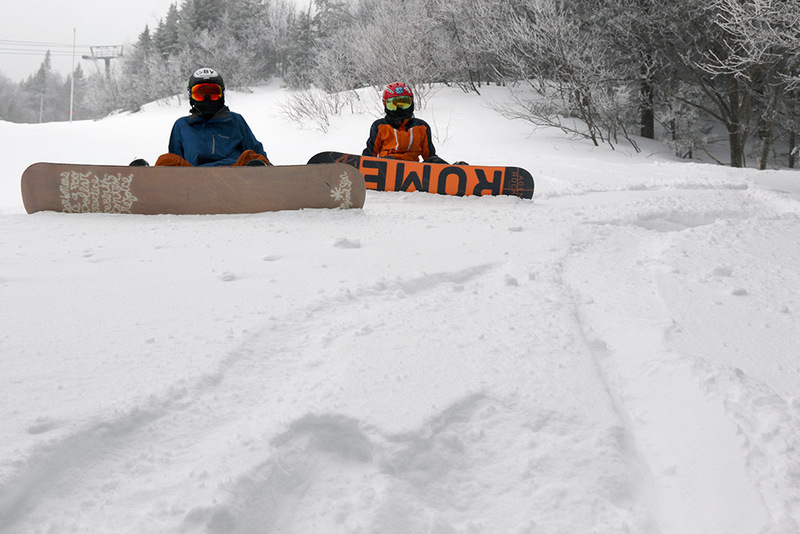 It was a Telemark day for the family yesterday at Stowe, but today was an alpine day for the boys, in line with plans to hit some steep and challenging terrain. 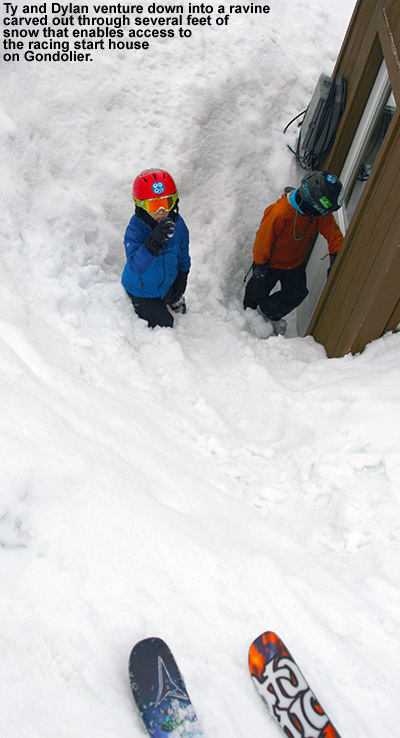 We were hoping to introduce Dylan and E to some of the Bypass Chutes that Ty and I had skied last Saturday, with additional plans to head over to the Gondola area of Mt. Mansfield and potentially up to some of the steep alpine terrain of The Chin. The weather was looking pretty good, with clear blue skies and fairly seasonable temperatures. E had tweaked her back a bit the other day, so she ultimately decided that the best course of action would be to rest it, and I took the boys off to the mountain in the mid afternoon. On our drive, the one thing I quickly noticed was that today’s temperatures were actually a bit colder than yesterday’s – whereas it was roughly 50 F in the lower mountain valleys yesterday, today I was seeing numbers more in the mid 40s F. The car thermometer was reading just 39 F when we arrived at the base of Mansfield, and that got me a little concerned about the snow surfaces, since yesterday’s slightly warmer temperatures were already somewhat marginal with the softening. Today had 100% sunshine though, so I was hoping that could make a difference. 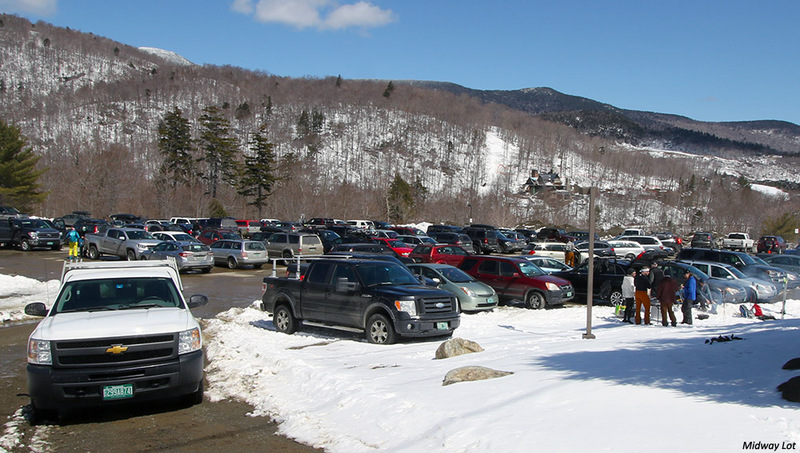 As soon as we arrived in the Mansfield Parking Lot, it was obvious that the number of people at the resort was nothing like what we’d encountered yesterday afternoon. 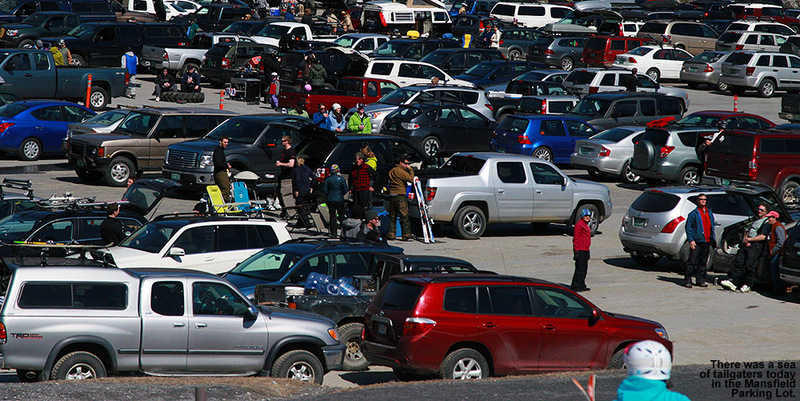 Yesterday we just pulled up and grabbed a parking spot in the first row, directly in front of the Mansfield Base Lodge, but today I didn’t see a single open spot in the entirety of the east side of the lot. I eventually decided that it would just be easier to park over in the Midway Lot at the Gondola, since we’d be finishing our day there. Even over there though, there was a healthy amount of vehicles, so the resort was definitely drawing a crowd for its last official day. 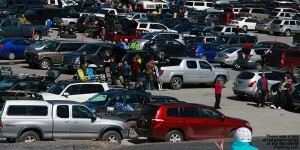 As we made our way over to the base of the Fourrunner Quad, we witnessed the incredible sea of vehicles and skiers that filled the Mansfield Parking Lot. The sights and sounds were simply everywhere, there was one source of music that was so loud that it sounded like a live band was playing. I even heard someone mention something to that effect a bit later, but didn’t know if it was true. 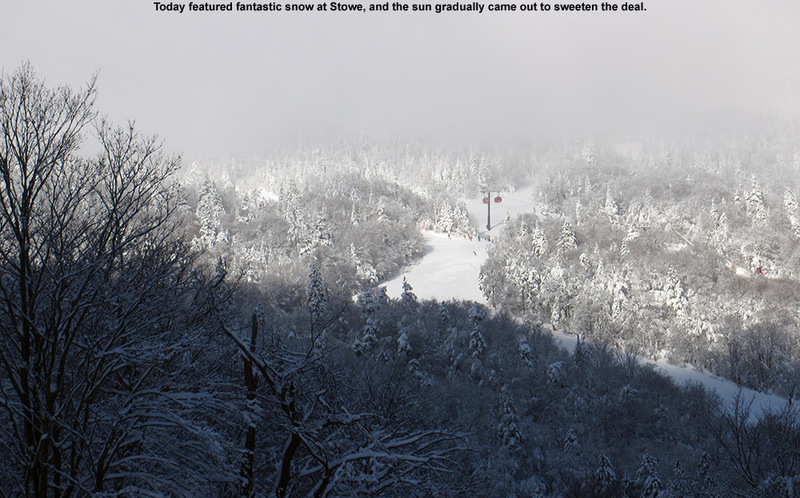 Anyway, that’s what happens when you combine that last day of Stowe lift service with weather like we had today. Up at the summit of the Fourrunner Quad it was certainly a bit chilly, and I suspect that the temperature was right around the freezing mark. 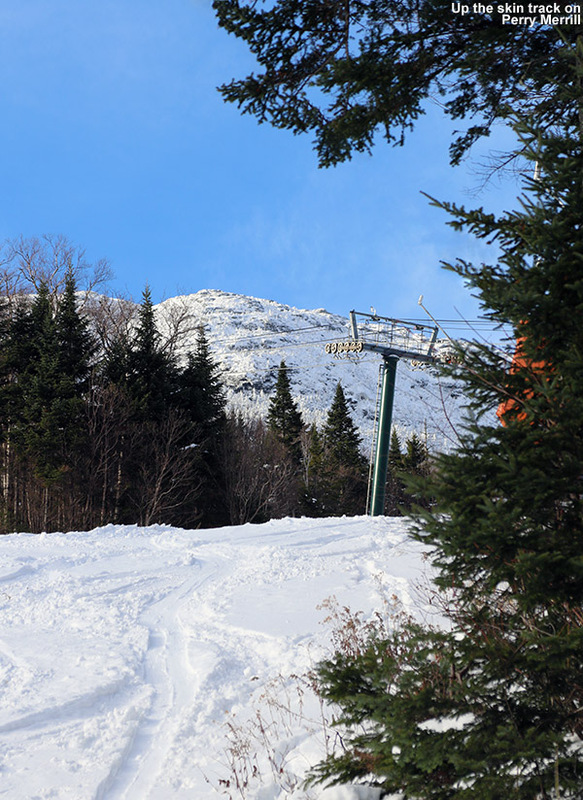 I thought about doing a run on some of the quad terrain before making our way over to the Gondola, but decided that it was best to get going early so we’d have maximal time for whatever touring we wanted to do. The snow seemed at least somewhat softened in the sun from what we could see below us on our trip up the quad, but as soon as we dropped onto Nosedive, we found out that anything out of the sun was going to be a total nightmare in terms of surface consistency. 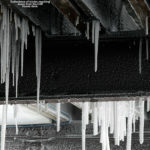 We saw that the upper entrance to Bypass was roped, presumably because of the firm snow surface. The trip down those next couple of pitches of Nosedive was quite hairy, and I wouldn’t have recommended it for anyone like us that doesn’t keep their edges sharp. 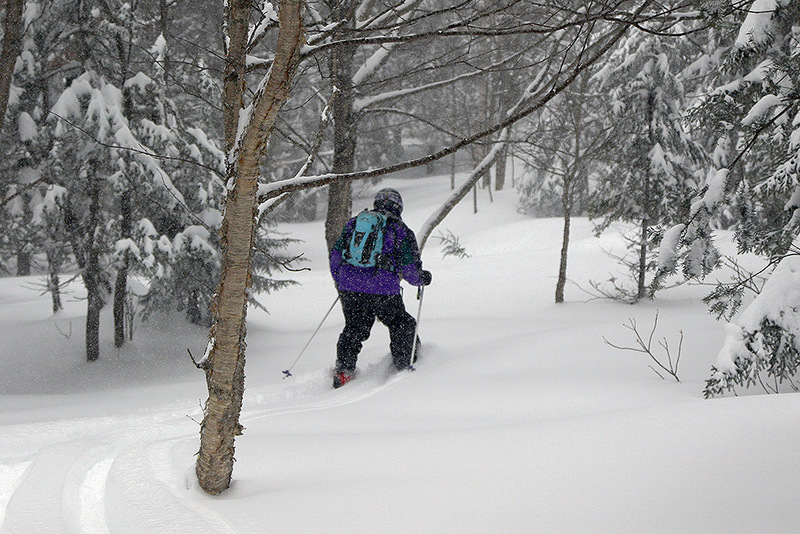 We picked our way down with some survival skiing to find that even the next entrance to the Nosedive Glades was roped off. Access over to Rimrock was only available once the pitch flattened out a bit, and we got our butts off Nosedive as soon as possible. Dylan sees the light at the end of the tunnel as he finishes off the ascent on Perry Merrill. Based on the snow surfaces, I didn’t think there was much sense in heading above tree line, but the ascent over to the top of the Gondola still looked viable, so we set our sights on that. 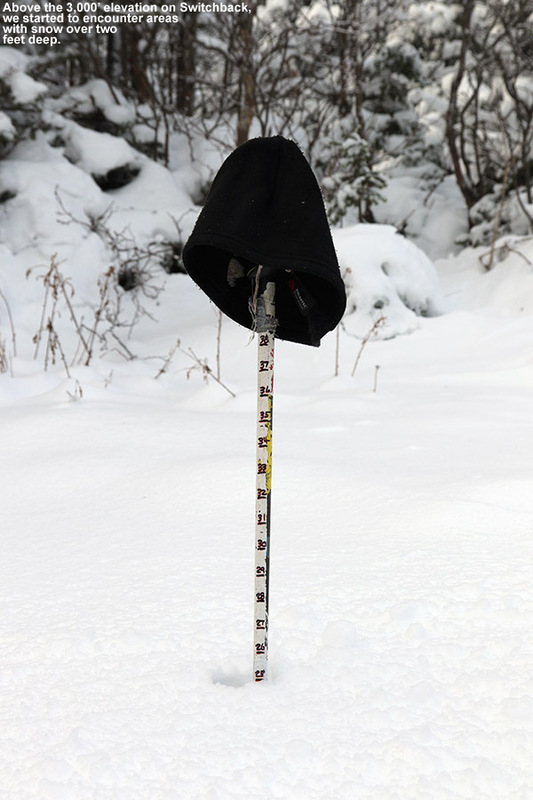 To make it easy on the boys, especially since they’ve been under the weather a bit this past week, I took care of carrying their skis for them. I skinned with my skis, and attached theirs to my pack. We actually encountered a number of people heading over to the Gondola via Rim Rock, they were keeping that aggressive traverse that would let them reach High Road and maximize their vertical. We were heading higher than that though, since we continued up Cliff Trail once we got to that High Road intersection. After a break at that intersection, we continued on up with the Cliff Trail ascent, and even though it’s just an intermediate pitch, it looked daunting to the boys compared to what we’d just traversed. It really went quickly though, it felt like we began to see the top of Cliff Trail just after ascending the first steep pitch, and even with the boys somewhat beleaguered pace due to recent fought illness, it couldn’t have taken much more than 10 minutes. We could still see some sunlit terrain above us at that point, so after a quick break, we continued on a bit more and finally stopped our ascent up near the flats leading to the Cliff House. 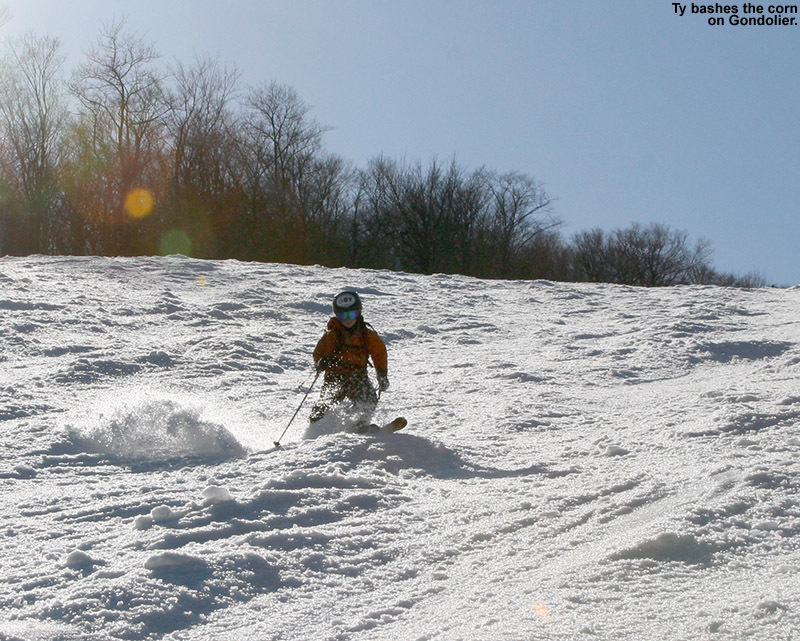 In terms of both sunshine and slope, there wasn’t much point in going beyond the first big pitch of Perry Merrill. We could hear, and in some cases see, people picking their way down through the Rock Garden and other, even steeper lines off the Mansfield ridgeline, and it sounded horrible up there. 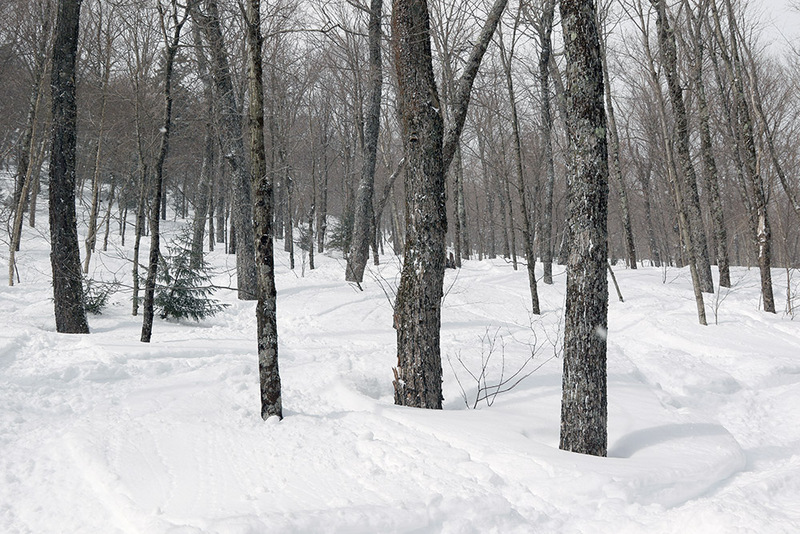 That terrain is shaded, high in elevation, and steep. 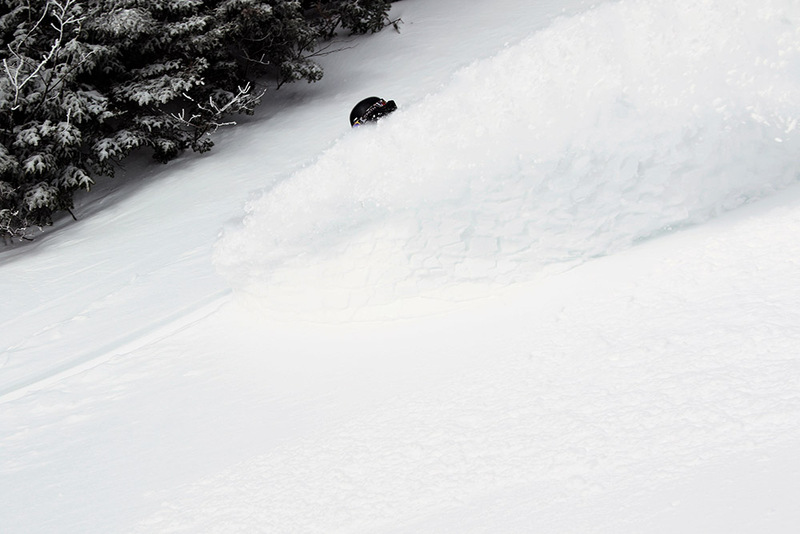 It looked like it was worse than what we’d found on Nosedive, and that experience was already going down as serving up the most hellacious ski conditions we’d encountered all season. At least the snow was being well-preserved for future use, but it had me longing for the fresh snow that Ty and I got to play in last weekend. The boys finished with a final snack and some roughhousing in the snow off to the side of the trail as we enjoyed some sun, and then we were off for some turns. We stuck to as much sunny terrain as we could, descending on Perry Merrill and then to Gondolier on the skier’s left. The snow was only marginally softened, so it was OK, but like yesterday, not really as great as the sunshine might suggest. It was still reasonably good corn snow, and fortunately it improved with ever turn we took as we dropped in elevation. All I can say is that the upside of the minimal softening is that even down in those lower elevations below the alpine, the preservation of the snowpack was looking quite good. I was happy for E though, as she’d made the right call in staying home and resting her back. 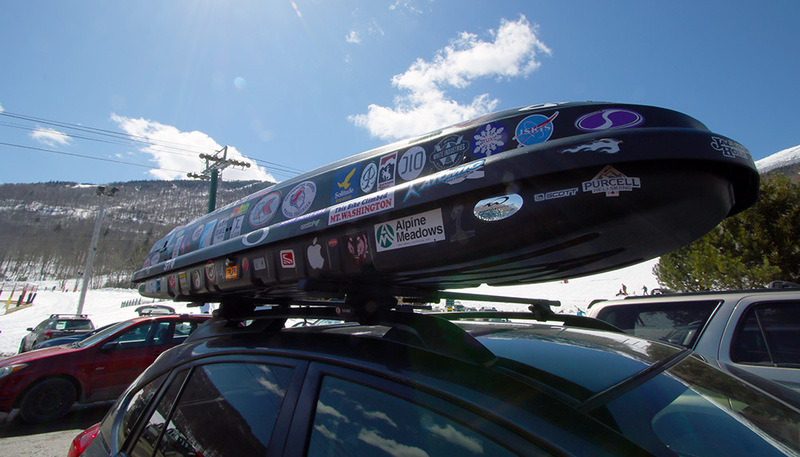 Although she missed a fun bit of hiking and touring, which gave us a nice workout, she certainly hadn’t missed out on any extraordinary (or even ordinary for that matter) spring skiing. For the final half of the descent on Gondolier, we used my camera (Canon EOS 30D) and E’s camera (Canon PowerShot ELPH 510 HS) between the three of us and played “Shootout”. It’s a contest in which everyone skis in front of the cameras, but also gets behind the cameras to serve as photographers. 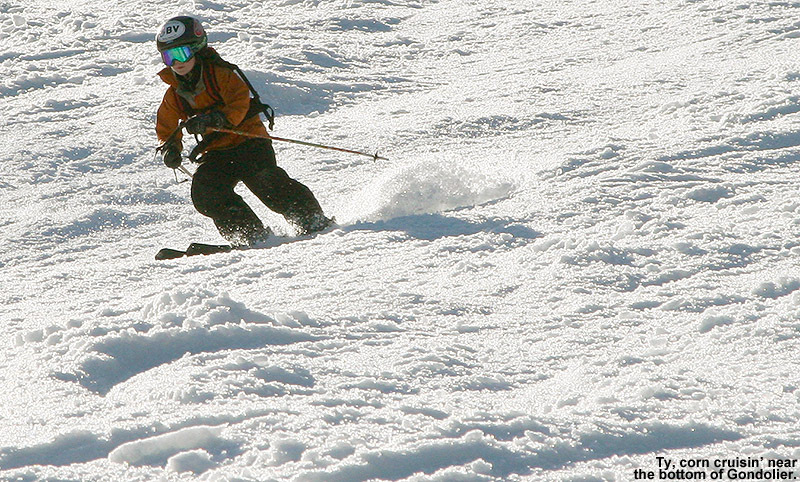 The goal is to see who can get the shot of the day in both the photographer and skier roles. E’s point and shoot camera does have a decent high speed shooting mode that runs at 7.8 FPS in low (~3 megapixels) resolution, and it does a decent job of capturing images, even if you can’t really view your subject the way you can with a DSLR. The big downside of her camera is that the focus, exposure, and other parameters are set on the first shot and remain fixed – also, you have to stop shooting to adjust the zoom. For sports photography, this represents a serious disadvantage compared to the DSLR that is rapidly adjusting all these for every high speed shot, and even though it’s only shooting at 5 FPS, it’s going at full resolution and is attempting to optimize the picture every time. Also, you can zoom on the fly and keep filling the frame with the skier if you want. E pointed out that I had a huge advantage using the DSLR (since it’s big, the boys don’t typically use it), so it was a bit uneven in that regard, but we’ll see how things come out in the end.